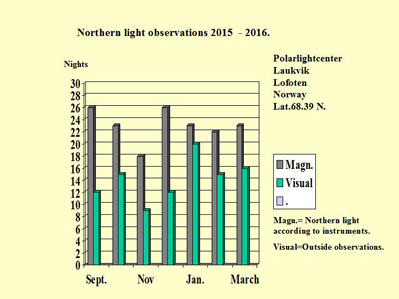 After 7 months of northern light season the statistics are showing the results. March was magnetic the most active ( 25 nights ) but it was this season rather cloudy. 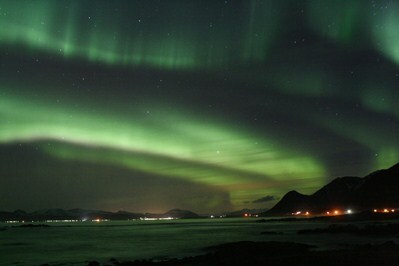 October and March had both 15 nights visible northern lights. At the end of August we are starting again the presentations and hopefully it will be a great season again. Last week we had 4 nights with activity and nice auroras. 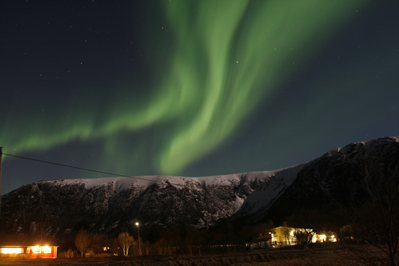 Thursday the 7 th of March beautiful auroras in the north and mainly in the east. K5 activity and clear sky. At the beginning of the week we had many rain showers. Later in the week it became colder and we had clear skies. 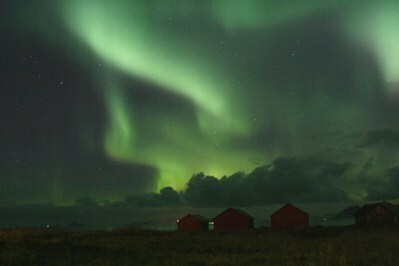 Thursday evening was the best with beautiful auroras, colorful and moving. 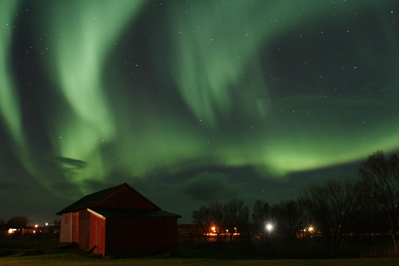 A huge coronal hole caused many nights in a row the auroras. A week with less activity. Only Tuesday and Thirsday. 3 nights enough activity but most cloudy. The 12th of February the evening started with a low bow in the north. A perfect week for auroras. 6 evenings in a row. Snow and frost and often clear skies. 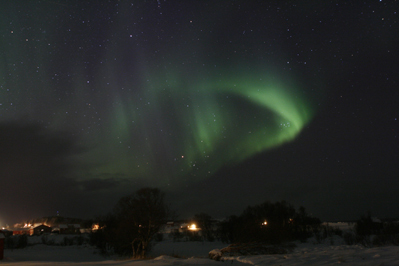 During a presentation the 8th of February we often observed the northern lights. This picture is taken after midnight. More intense to view because the street lights are just closed. Due to a huge coronal hole we've seen 3 nights in a row the auroras. This picture is from the 31st of January. The evening started cloudy but later it cleared up although we had some veil clouds. Suddenly high up in the sky Lady Aurora was dancing and even played the piano. 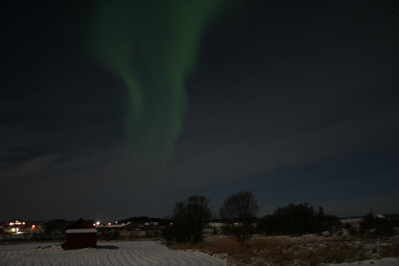 The 21st of January, after midnight, nice auroras were visible, from west to east. This week we had 4/5 nights visible northern lights. Together with snow and moon light, the surroundings of Laukvik are amazing beautiful. 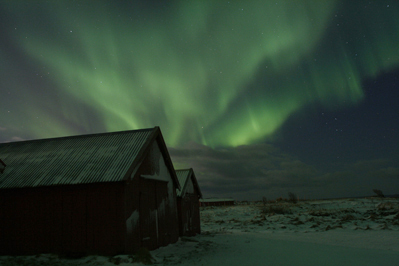 After midnight the 4th of January (so the 5th of January) amazing auroras were visible. Suddenly the sky became clear and the graphics on the instruments went out of screen. 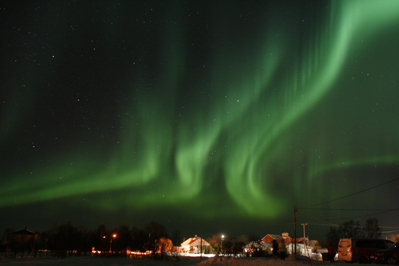 Colourful northern lights in all directions, moving high up in the sky in different forms and often very bright. 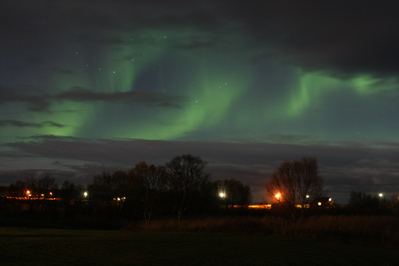 Just after the presentation on 29th of December for short moments the northern lights were visible high up in the sky. 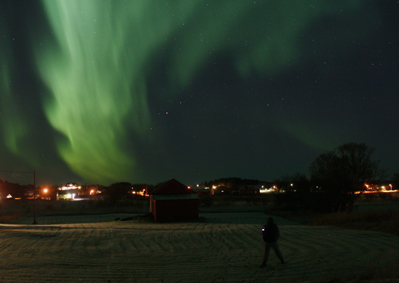 Later that evening after midnight, pulsating auroras were to be seen, quite a while. 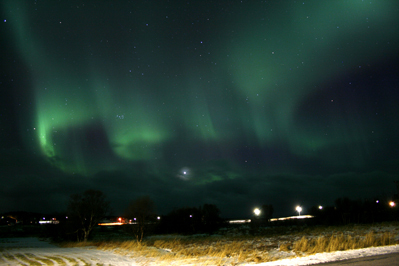 This month was rather cloudy and the auroras appeared 12 nights. In this time of the year we only have a few daylight hours. Long nights to view the auroras. 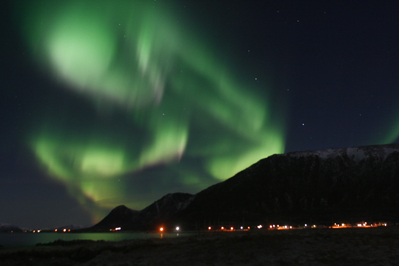 This week we have seen 3 nights the northern lights. 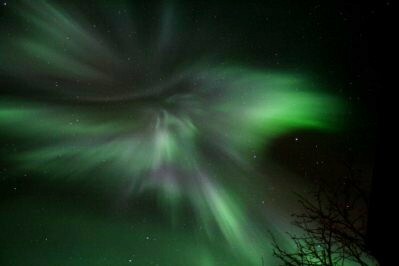 The picture is from the 15th of Dec.
Lady Aurora was dancing for us, sometimes rapidly and her dress was in full colours. This weekend the auroras were visible very early. Later in the evening the activity was much higher but it became cloudy. Monday evening, after a presentation, before going to sleep the northern lights were visible between the clouds at around 1.00 hrs. 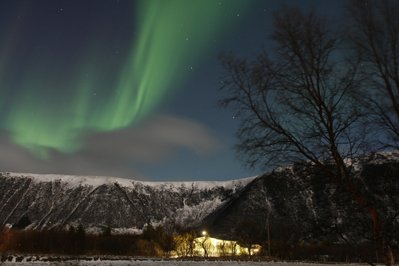 This week 5 nights with activity and 3 times with often short moments visible northern lights. 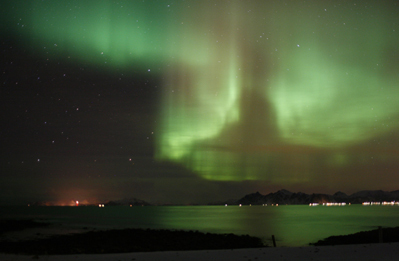 Unfortunately we had not much luck with the weather this week for viewing the auroras. 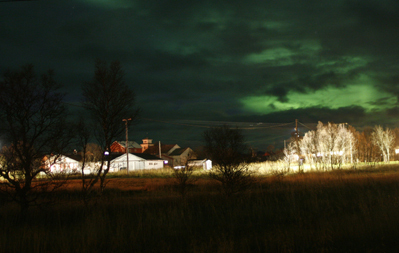 Tuesday the 13th of November some parts cleared up and the northern lights were visible between the clouds. We could also see some burning meteors crossing the sky. There was often magnetic activity this week. At least two nights we have seen strong and beautiful northern lights. 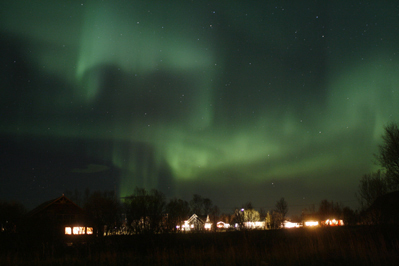 This week we saw 3 nights the auroras from the 5 nights with activity. Robs last sms- warning predicted some open clear parts around 2.00 o'clock midnight on Sunday the 4th of November. I woke up around 1.30 (see picture) and on the instruments was high activity. 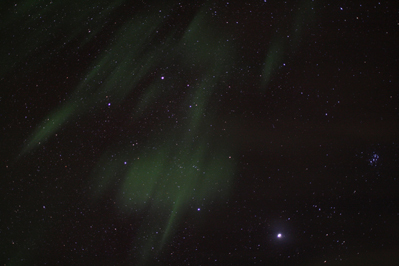 Some open parts with stars were visible and while looking in southern direction I even saw pulsating auroras. Together with bright moonligt this week we had many clear skies. 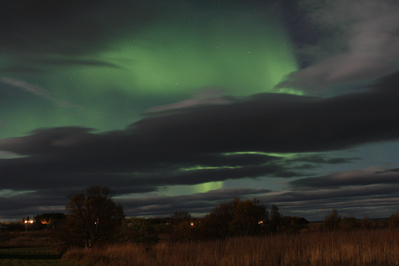 In total 4 nights with activity and we saw 3 nights great auroras, see picture from wednesday, the 24th of Oct. 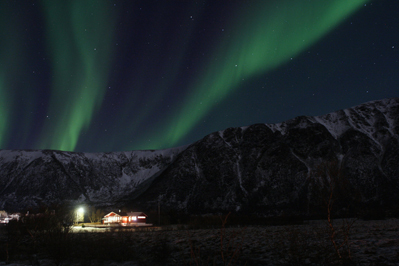 The last two weeks we had 9 nights with magnetic activity and in total 7 nights visible northern lights. 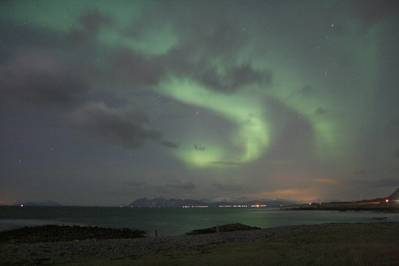 Sunday the 21st of October visible auroras between the clouds and rain showers, see picture. 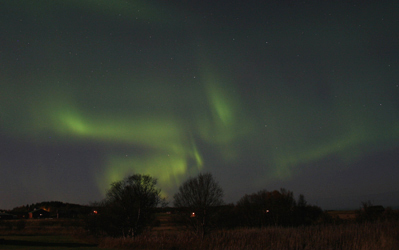 Last Sunday, the 7th of October there was a geomagnetic storm. Unfortunately the sky was not clear but early in the evening an open part in southern directions. 24 nights activity and only 13 nights with visible northern lights here in Laukvik. This year September was rainy and cloudy compared with last year. This picture is from Sunday the 30th. Auroras and clouds can be very dramatic. 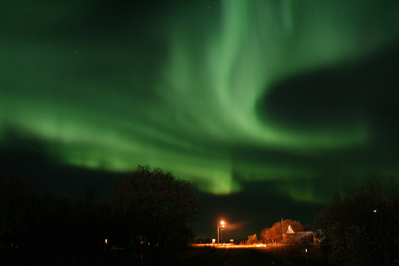 Around this time of the year auroras are visible around the equinox. 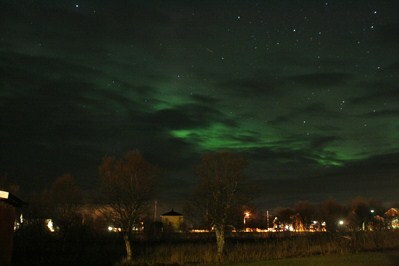 Activity enough but here in Laukvik it was too cloudy to view the northern lights. This picture is from the 18th of September. Early in the evening bright and colorful northern light and some later more faint but anyhow great to see in the starry night. We have dark nights without moonlight. 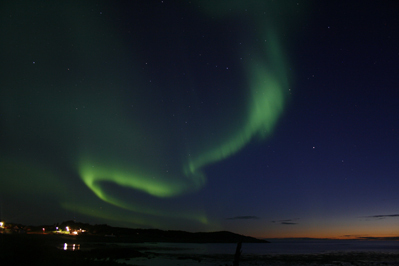 Tuesday, the 11th we went to the seashore to see faint but beautiful auroras. 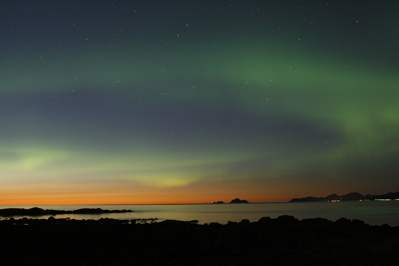 A nice quiet evening with some auroras above the sea together with the orange glow of the sunset. Sometimes for a short while and some evenings a bit longer. Also sometimes with hardly activity on the instruments. This picture is from last Saturday, the 8th of September. 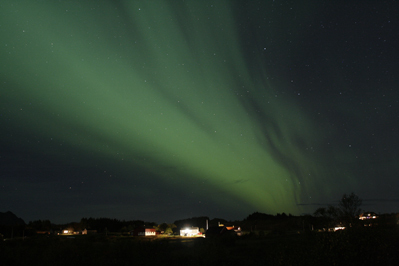 The night from 25 til 26 of August the instruments showed unusually strong activity but there were too many clouds to see the auroras. Although the Sun is most quiet without active solar flares from sunspots, we saw this season beautiful auroras thanks to coronal holes. At the end of August we are looking forward to a new season and like to welcome you again. A very active week with many nights great auroras. Thursday evening the 22nd of March the northern lights were the best and in all directions. This picture is taken in south-east direction. 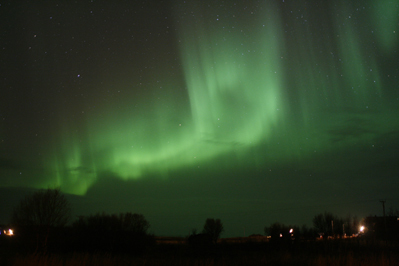 Due to a huge coronal hole we saw at least two nights beautiful auroras. Some other nights because of the clouds just for short moments. 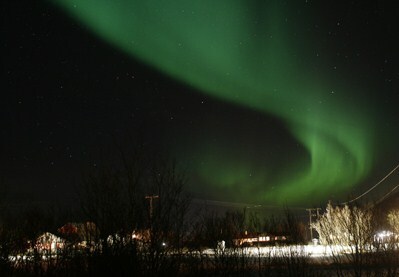 The 14th of March (see picture) the northern lights were colourful and visible in all directions. 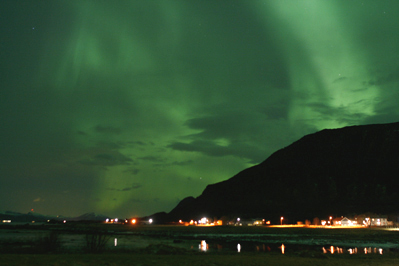 Four nights visible northern lights and 4 nights activity. 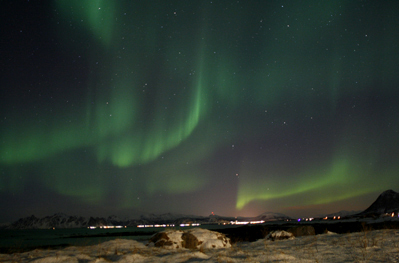 Friday the 9th we could see amazing auroras during and after the presentation. Two nights also after midnight colorful auroras were visible. 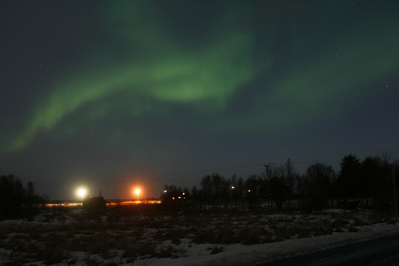 6 nights aurora activity and here in Laukvik we saw three nights the northern lights in different forms and structures. 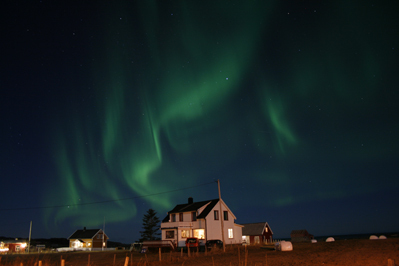 Five nights with visible northern lights and 6 nights aurora activity. Thursday was the best evening. This picture was taken before the presentation started and after the lecture moving and pink colored auroras were visible all over. All nights we saw the auroras this week. Sometimes bright and colorful or other nights more faint. One night mostly behind the clouds. This picture is from Sunday, the 18th of February. 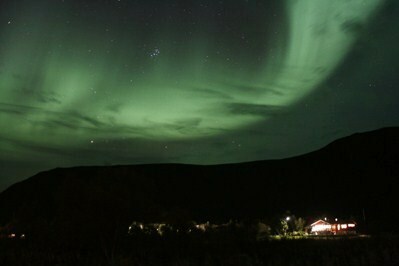 This week we had the auroras as a surprise. The picture is from the 10th and at first a faint bow was visible. 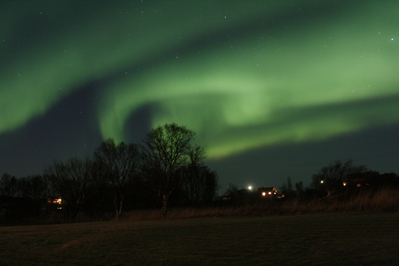 Some later the northern lights became much stronger for a short while. 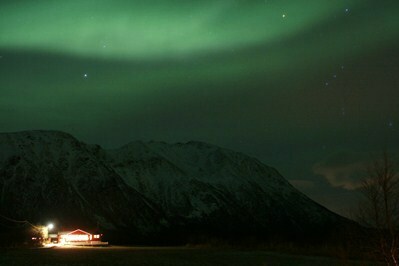 Clear nights and 3 nights visible northern lights. The picture is from 3 Febr. 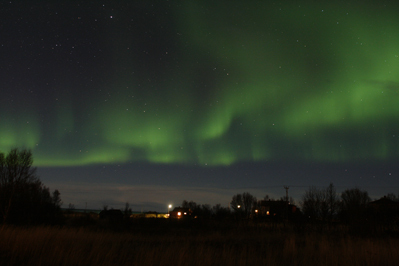 The evening started with a nice bow in the north and later the auroras were moving higher up. The week started rather cloudy but ended with some fine sunny days and clear nights. The two last days the auroras were fantastic. This picture is from Saturday but Sunday the northern lights were even brighter and pink colored. This week we had really cold days and nights and many clear skies. 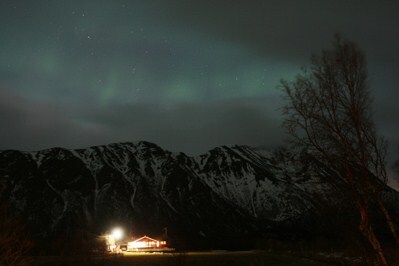 We had 5 nights activity and 4 nights with visible northern lights. Due to a coronal hole we enjoyed some nights the northern lights. 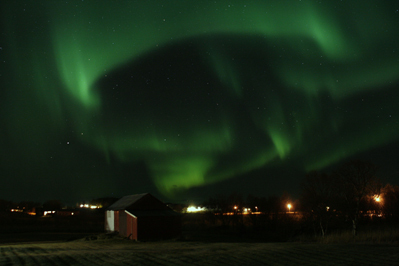 The auroras started faint but became soon stronger. 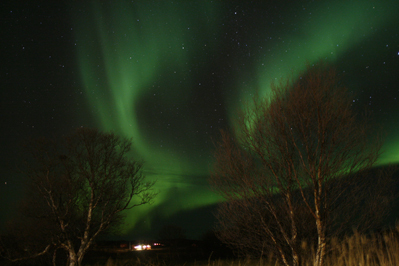 Some later in the evening we saw again beautiful auroras high up and moving in all directions. 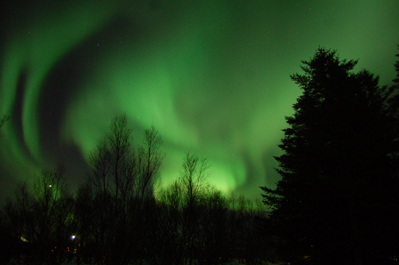 The first week of the new year we saw 4 nights the northern lights. Sometimes a nice bow and sometimes more moving higher up in the sky. 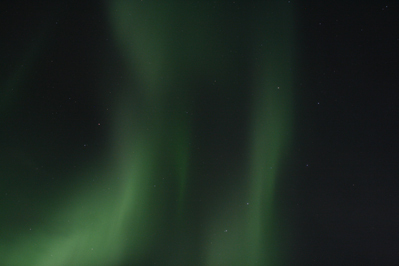 Because of the bright moonlight the green color was less visible but the auroras were still beautiful. 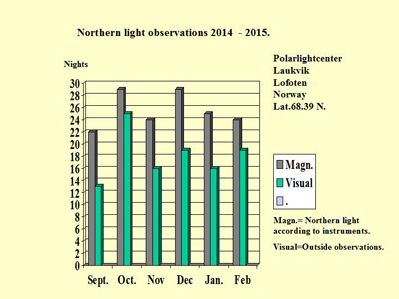 In December we had 19 nights activity on the instruments and 13 nights visibility, here in Laukvik. 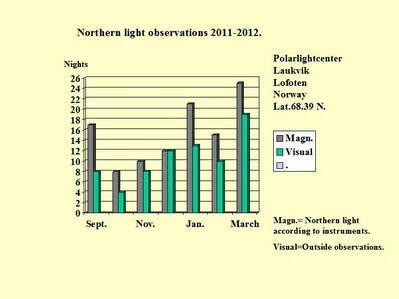 This last week we had 6 nights northern light activity on the instruments and we saw them all the 6 nights. Also on the 31st of December, together with the colorful rings around the moon. We wish you all the best in 2018 ! 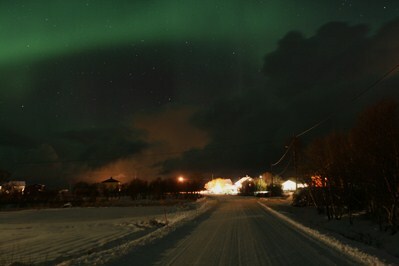 Walking back home after a nice Christmas dinner the auroras accompanied us in a beautiful snowy landscape. 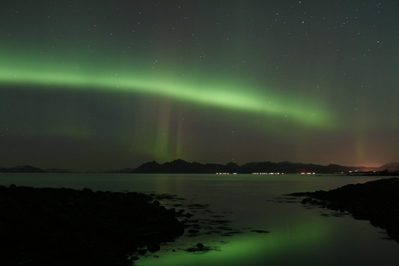 Two nights this week we saw beautiful auroras and one evening a faint bow. 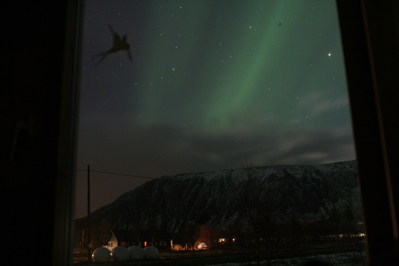 The 12th of December, see picture, a huge green swan flew over the roof of the Polarlightcenter. 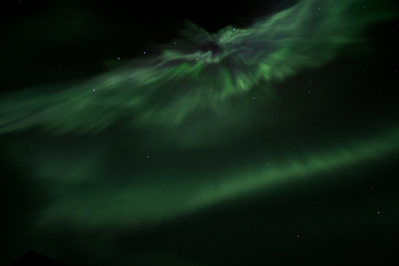 In the old days people saw often bird figures in the northern lights and told each other nice stories about them. 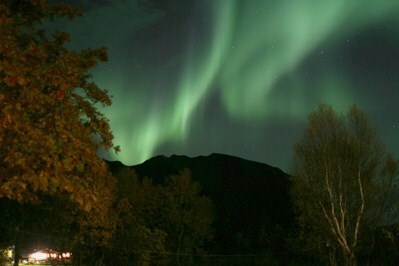 This week there were 6 nights with activity and we saw 4 nights the northern lights. When the snow changes the world in a fairy tale, together with auroras and moonlight, it is pure magic! The picture is from the 6th of December. Only two nights with activity this week and we saw the northern lights only once. November was a good month, though. We saw 16 nights the auroras and we had 22 nights activity. 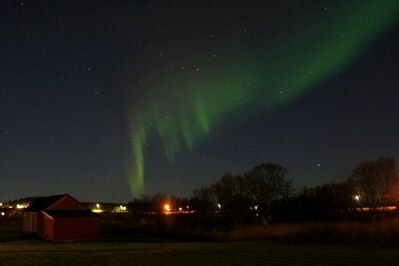 This week we had 5 nights activity from a coronal hole and we have enjoyed 5 nights the auroras. Last Friday evening were the most exciting displays. The northern lights started early and lasted for hours. Fast moving in all directions, green and pink coloured and many times breathtaking for our guests and ourselves. Only in the south the Sun is still visible behind the mountains. This week the northern light activity was not so strong. Saturday the 18th of November, see picture, around 22.00 hrs, we saw for short moments beautiful displays in the north and in the west. 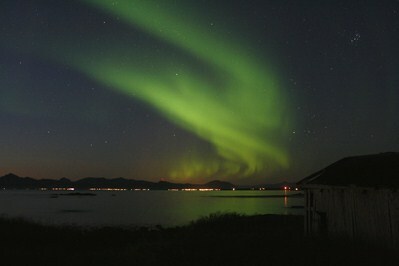 From the 5 nights with activity we have seen 3 nights the northern lights. Although the Sun is blank, no sunspots, the auroras are visible due to a coronal hole. This picture is from the 8th of November, early in the evening. 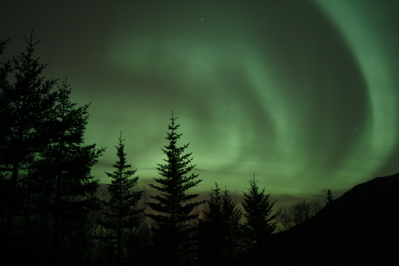 Although the weather was not optimal to view the auroras we have seen 4 nights some northern lights. 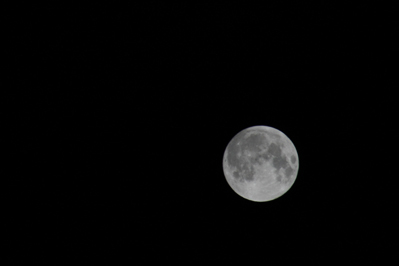 Also the bright moon made it not easy to see them. 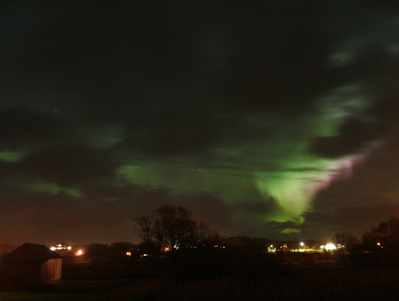 But.... the 4th of November Lady Aurora appeared stronger between the clouds. With some fantasy you even can see her dancing legs on this picture. 14 nights with visible northern lights. The clear days are gone and snow showers arrived. Beautiful white landscapes for some days now. Snow showers mean cloudy nights. 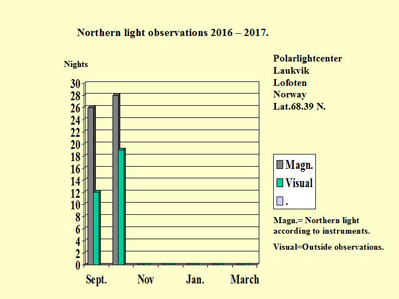 At the beginning of this week we had two nights visibility of the northern lights and 5 nights with aurora activity on the instruments. This picture is from Tuesday 24th of October, early in the evening. 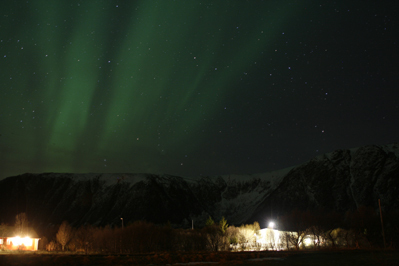 6 nights with aurora activity and 6 nights visibility. Great week with clear days and nights except last Monday. This picture is from the 19th of October. 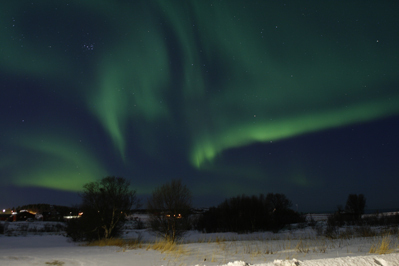 This week we had five nights aurora activity and saw the northern lights twice. 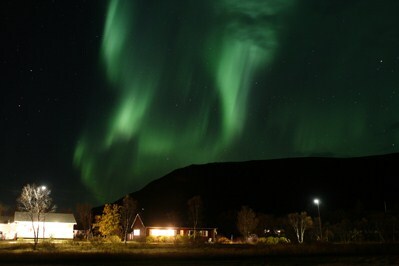 The picture is from 11 October, the northern lights started very early. Going to the beach an orange moon was visible from behind the mountains in the north. 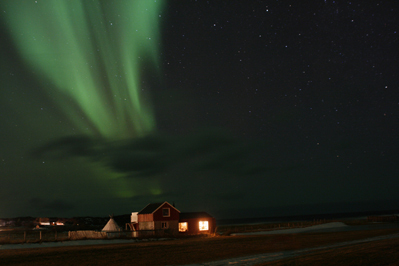 An perfect evening with soft coloured and dancing auroras. We were so lucky to see the auroras for short moments between the rain showers. Mainly faint but sometimes bright and colourful, even pink. For many days high activity. A beautiful week with clear moonlight. Many nights with clear sky but also nights partly clouded. The picture is from last Tuesday, 3 October, short after midnight. This week we saw 4 nights the northern lights. 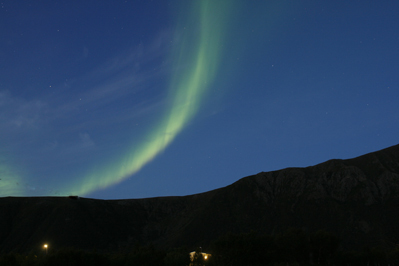 September had 27 nights with aurora activity and we saw 19 nights the northern lights. September had many sunny clear days and beautiful clear and starry nights. 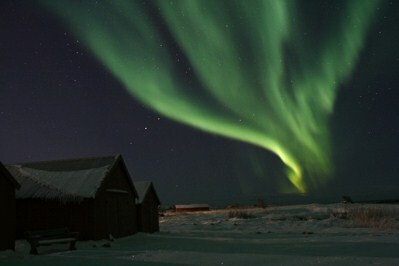 This week 7 nights with activity and also 7 nights visible northern light, due to a huge coronal hole and clear nights. 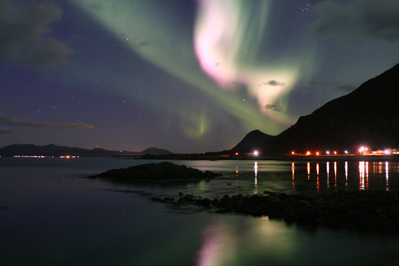 Lady Aurora showed herself sometimes faint but also bright and in all directions. This picture is from Wednesday evening, the 27th of September. This week we enjoyed a beautiful autumn. Sunny days and many clear nights. 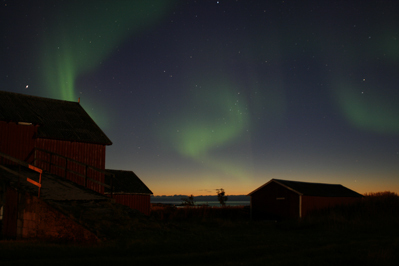 Our overnight stay guests could already view the auroras at sea at their first evening and 5 following nights except last Friday. This picture is from the 20th of September. 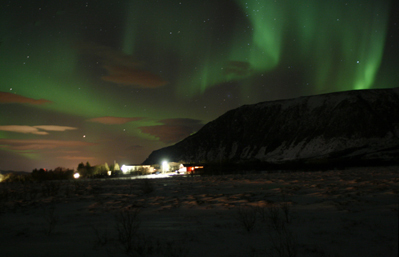 From the 6 nights with activity we saw 4 evenings the northern lights. 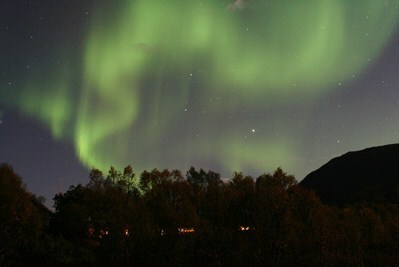 Thursday, the 14th of September, the auroras were the best. First we went to the seashore to catch also a glimpse of the orange glow of the sunset. 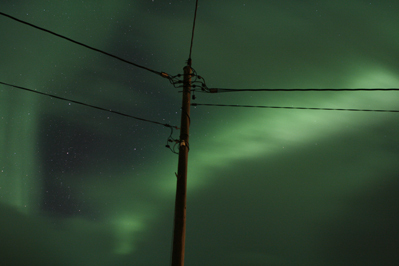 While walking back home the auroras were moving above our heads and were breathtaking. 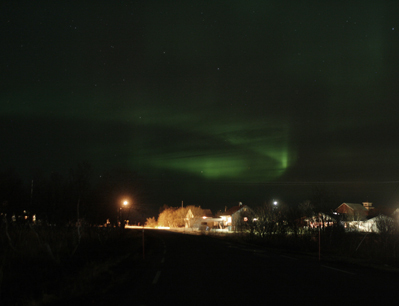 We had 5 nights with activity on the instruments and 3 nights visible auroras here in Laukvik. Last night I was so lucky not to go to bed early. At night the clouds opened up and even the bright moon was visible. 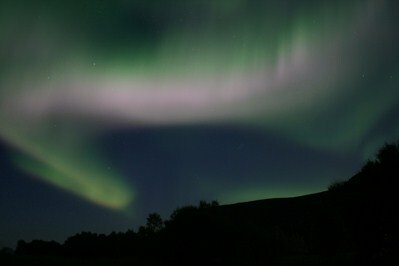 The auroras were also purper colored and were moving high up in the sky. The new season has started. 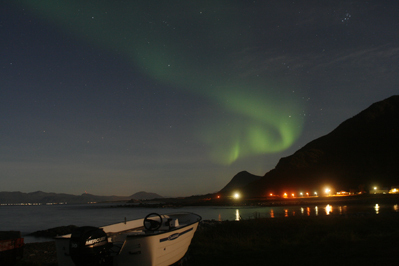 The 19th of August we saw the first auroras of this new season. Today around 12.00 hrs UTC on our instruments the strongest signals in many years from an X9 solar flare. 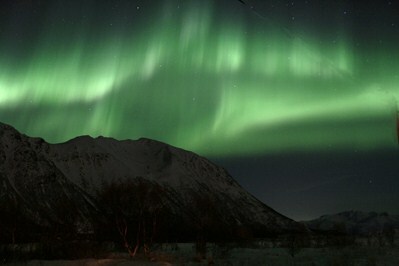 This is a good sign for strong magnetic storms and beautiful northern lights the coming nights, also on lower latitude. 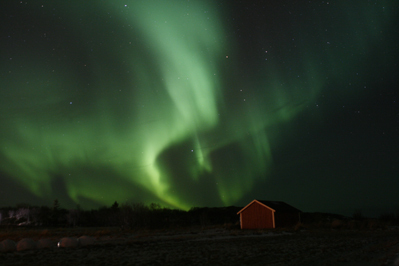 Although the Sun is very quiet, there were many nights with magnetic activity due to the coronal holes. 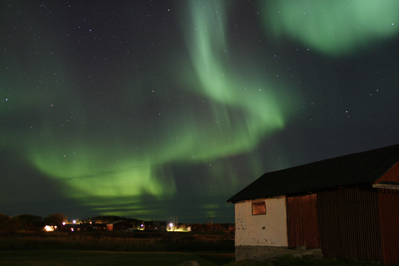 This season in the month November we have seen 21 nights the auroras, a month with many clear nights. At first some faint northern lights became visible but soon after Lady Aurora began her amazing dance with graceful movements, also high up in the sky and with many colors in her skirt. 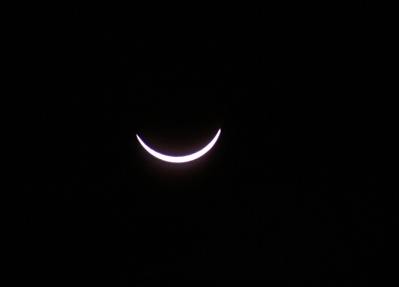 The nice new moon completed the show. 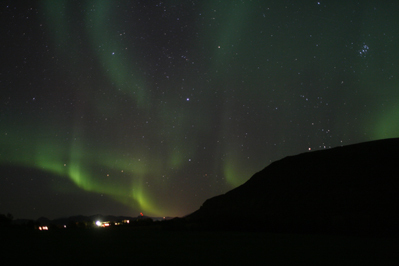 Activity on the instruments and the auroras were for short moments bright but mostly faint between the clouds. Around 0.30 hrs. 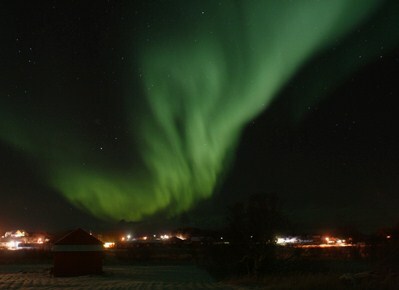 brighter and stronger northern lights were visible in the west. Today a magnetic storm started already very early and even before darkness the northern lights were visible in the south and south east for only 15 minutes. Unfortunately it became cloudy again. 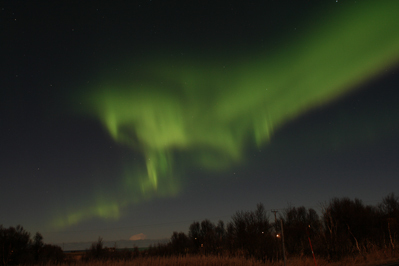 Already early in the evening pulsating auroras were to be seen all over. 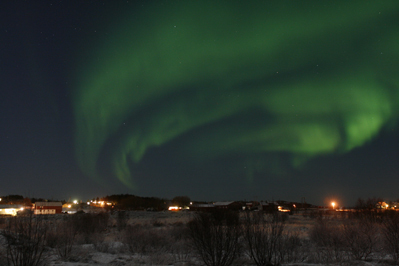 Pulsating means the northern lights are on and off in some seconds time. 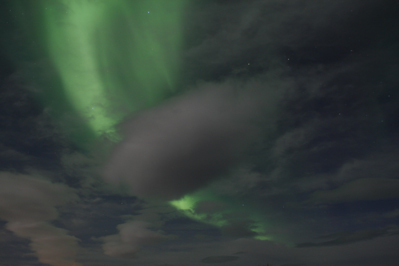 Due to a huge coronal hole the auroras appeared between the clouds. Not so bright and colorful which you will expect during a magnetic storm but anyhow it was a beautiful evening. sun, lots of snow and clear blue skies. 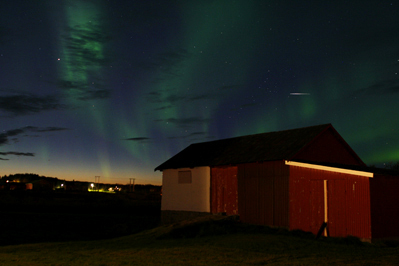 At night the auroras were often visible surrounded by many stars. We had to cancel several presentations this week because we both got influenza. Hopefully we are recovered again next week. The sky was very clear and twinkling stars and bright planets were to be seen. During the presentation the auroras were visible but after the presentation we enjoyed nice and bright and moving auroras with different structures. When there was stronger activity on the instruments it became cloudy. 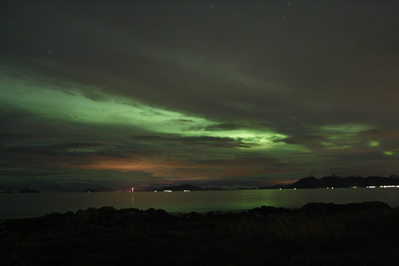 Later in the night pulsating auroras behind the clouds. 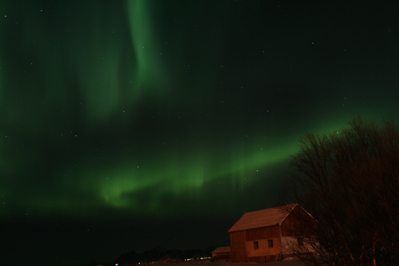 During the presentation nice auroras were visible in the north, east and west. 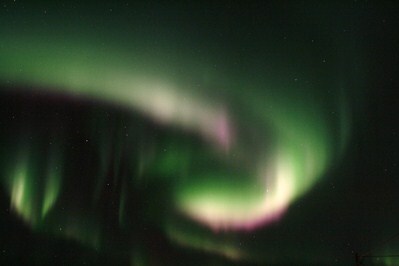 For a short moment we even enjoyed pink colored northern lights in a fast running band in the north east. Just before the presentation and waiting for the guests, a strong display on the monitor showed high activity. 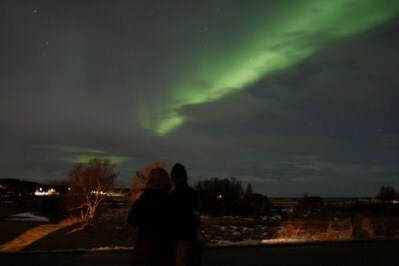 Together with two other guests we saw beautiful auroras for a short moment. The clouds appeared and the activity became less. 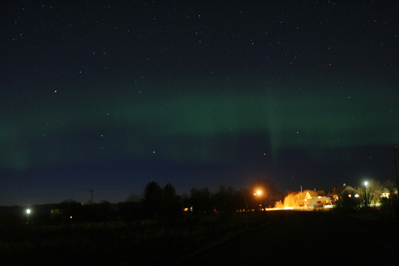 Later this evening the northern lights were also visible looking to the south. 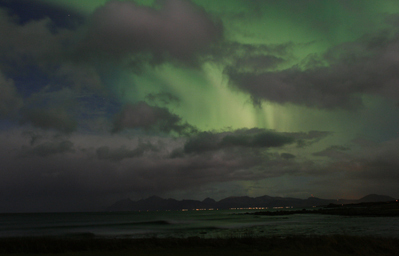 From Svolvær we could see the orange glow of light reflection against the clouds. Also tonight many clouds but also snow showers. During the presentation we saw bright auroras from east to west. After midnight a magnetic storm and for a short moment we saw bright and colorful auroras, fast moving and curling, high up in the sky. Unfortunately it became cloudy again. It was not easy to take pictures in this stormy night. Early in the evening a very faint bow was visible low at the northern horizon. Low clouds were coming in. Around midnight for a short moment Lady Aurora appeared to wish us a good night. Because of the moonlight the auroras were less visible, this evening. 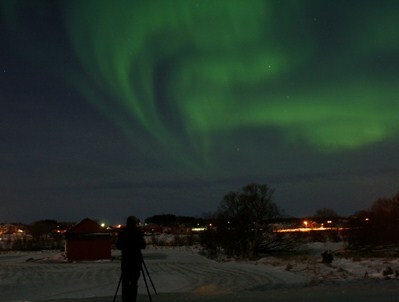 The northern lights were anyhow nice to see and to photograph by our visitors. 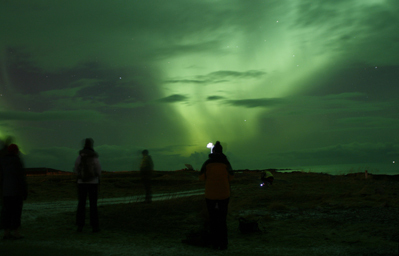 To plan a holiday to see the northern lights does not guarantee that you will succeed. 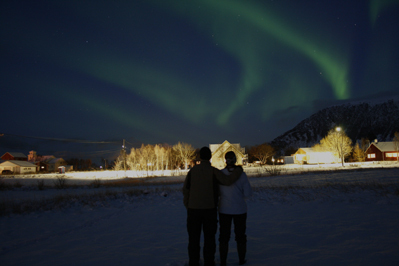 This couple did and were so lucky to see the auroras several nights in different forms. Around 21.00 hrs. in the break of the presentation the bright northern light bow got more structure. At that time the red planet Mars was visible low in the west. Some later the bow was moving very fast and showed pink colors too. 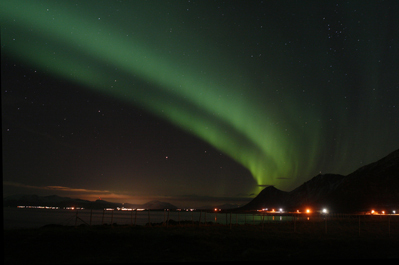 Several bows appeared and late at night the northern lights were even higher up visible. 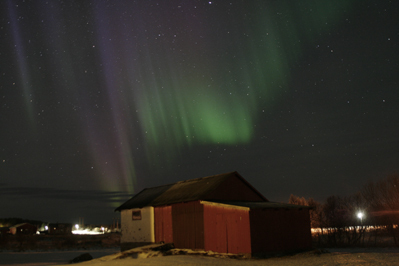 Early in the evening the northern lights became visible in a bright bow with more or less structures in it. 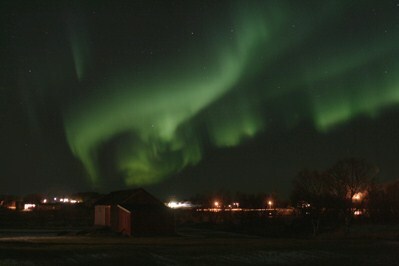 Around 23.30 the whole sky was lightened with moving auroras. Around 19.15 hrs. 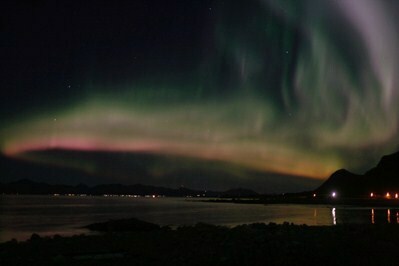 I went to the seashore and after a while I saw such a display of northern lights which was pure magic. It came rolling from behind the mountains in different forms and colors. It was overwhelming and breathtaking. At first a small bow, low at the northern horizon and some later a huge display in the north west sky and lit by the moonlight. 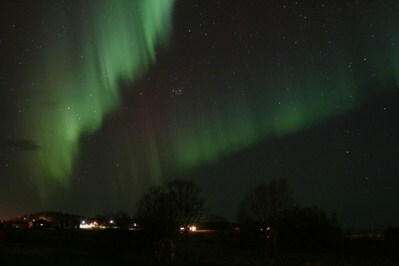 Late at night when I woke up I still saw bright fast moving auroras together with white pulsating auroras. After many cloudy days we have finally a clear sky. Early in the evening we saw nice transparent auroras and during the presentation our guests could enjoy Lady Aurora in all her beauty. Before the presentation a faint bow was visible which became much brighter. 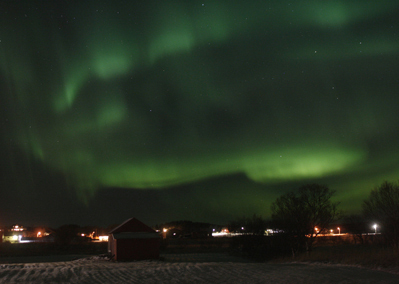 Soon after the auroras had moving structures and were amazing for about 15 minutes. 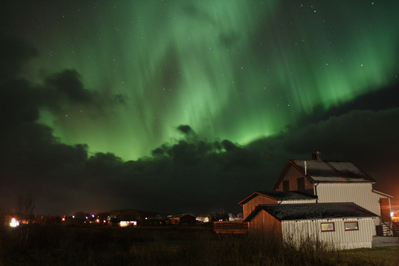 During the evening the northern lights were faint and lasted the whole night. Early in the evening there was already strong activity but the sky was cloudy. 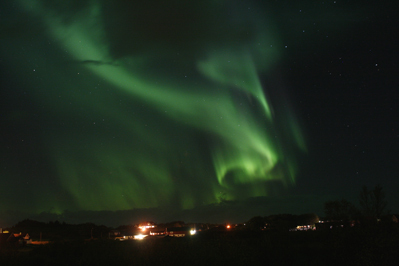 At first we could see moving auroras as white and gray clouds. During the presentation we went outside several times because the auroras were visible in all directions, moving and with nice structures and sometimes even pink colored. Such a nice evening with happy people. Like different weather forecasts predicted the clouds opened up this evening and faint northern lights were visible in the north west. 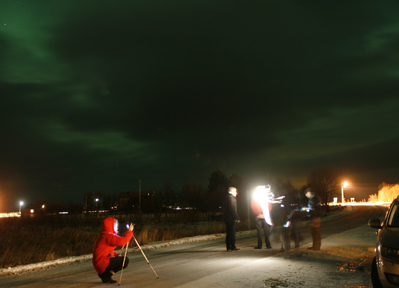 During the presentation low activity northern lights were visible and our guests could do a good exercise with their cameras and find the best settings for taking a picture. For a short moment the sky cleared up in the north west and faint northern lights were visible. 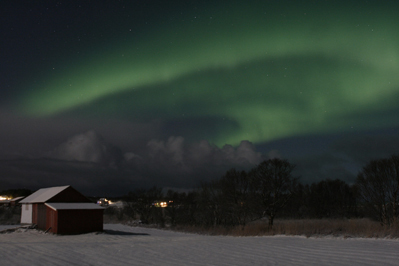 This evening there was high activity due to a huge coronal hole but it was too cloudy. 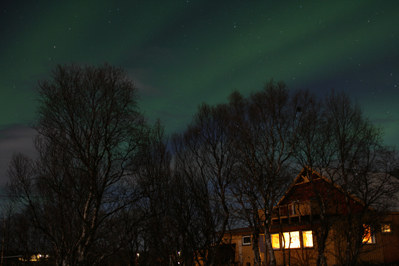 In the middle of the night when I woke up the sky cleared up and the auroras were visible. I took this picture from the kitchen window. A clear day and a clear night but unfortunately not much activity. At around 20.00 hrs the moon was still behind the mountains here in Laukvik. 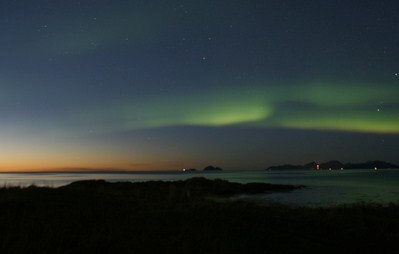 At the sea shore, the auroras were visible, low at the northern horizon. The instruments showed some low activity and around midnight the sky cleared up. Lady Aurora wished us a good night. Because of the bright moonshine the auroras were faint and sometimes less or better to observe in many directions. 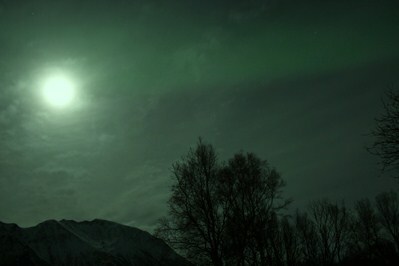 Bright moonlight, snow covered landscape and soft green auroras. Such a pleasure to be outside on such evenings. 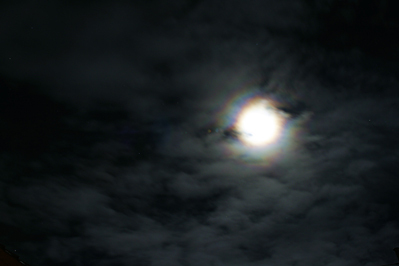 Sometimes appeared the bright moon but snow clouds covered the sky most of the evening. Low above the northern horizon a small band of auroras were visible. Lady Aurora was playing hide and seek with the clouds tonight. 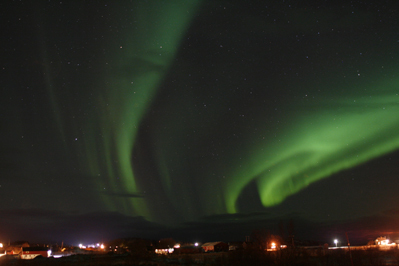 Because of the wind the sky changed constantly but sometimes the auroras were visible. 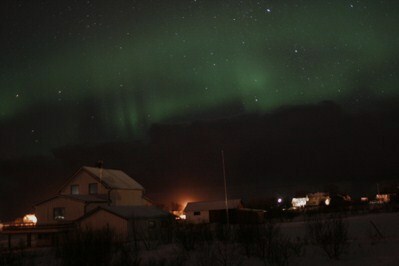 Just around 22.00hrs some open parts in the sky to see a glow of the auroras. Before we started with the presentation the northern lights were visible already and we decided to go first to the beach. 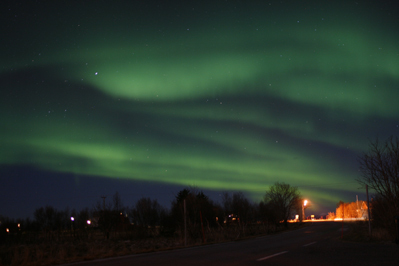 The auroras were visible in all directions. While looking in the instrument room we had to run outside again because moving and pink colored auroras were dancing in the sky. 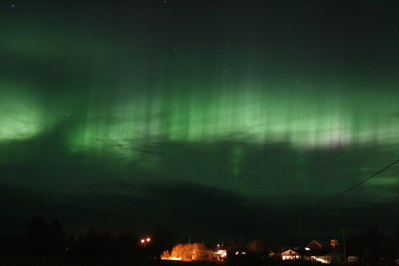 Early this evening, before the presentation started, beautiful and strong auroras appeared. Due to a huge coronal hole we could enjoy the northern lights for a great part of the evening. 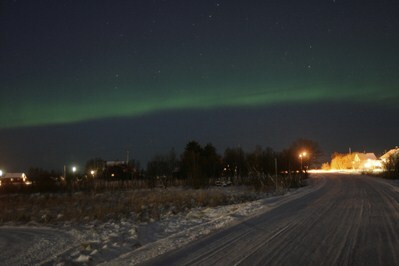 This evening also we could view the northern lights. Now with much more snow which makes the night even more beautiful. On the first evening of 2017 there was some northern light activity. But also snow showers and many clouds. Just before going to bed I saw a glimpse of the auroras between a thick layer of heavy clouds higher up and gray clouds down under. 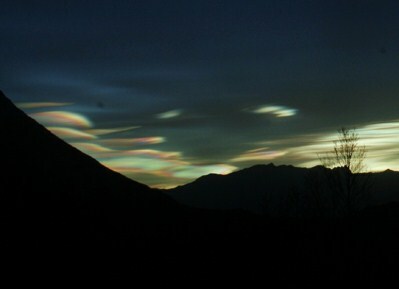 This morning we saw beautiful colorful nacreous clouds. 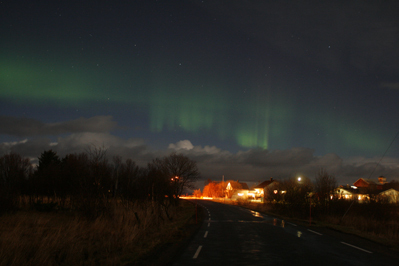 In the evening the auroras were visible, also in the south east. 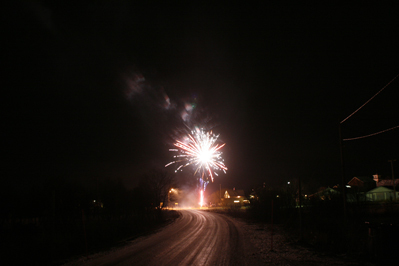 And around midnight the bright fireworks here in Laukvik to wish you all a peaceful New Year. The guests of the presentation from tonight could not believe that the cloudy sky cleared up but it did. Nice auroras were visible and nice pictures could be taken. 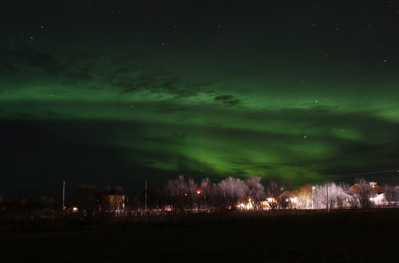 During the presentation the sky cleared up and a small band of northern lights was visible low at the northern horizon. 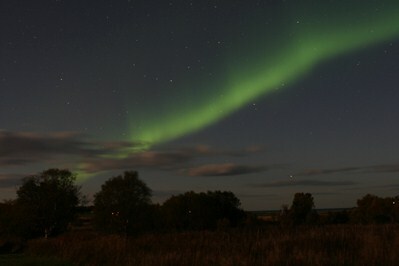 Some later the band of auroras became wider but unfortunately it became cloudy again. During the presentation faint northern lights were visible. Around midnight a huge bow from west to east became visible high up in the sky. Some later the auroras were moving and became stronger but still faint colored because the density in the solar wind was low. Short after the afternoon presentation the northern lights became stronger and stronger. First as a huge bow from east to west and soon after higher up in the sky, fast moving with enormous clouds of pink auroras. Can you imagine a more beautiful Christmas present for our guests and for ourselves? For some nights there was northern light activity from a huge coronal hole but unfortunately it was too cloudy to view the auroras. 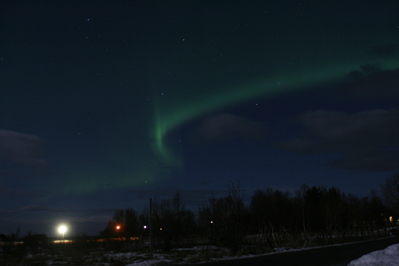 This evening , however, some open parts appeared and the northern lights were visible for short moments. It took quite some time before Lady Aurora showed us her dance again. A whole week without activity, lots of rain and cloudy weather happens not often. 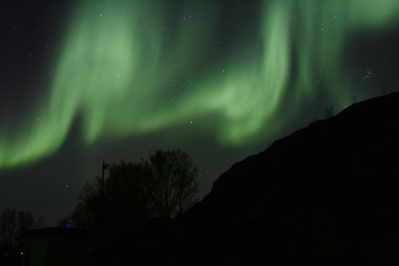 Due to the bright moon light the auroras were less visible although the activity was strong enough. The picture however showed much brighter green but I changed the colour in what was really visible. For quite some days a huge coronal hole causes auroras and this evening we can see the northern lights again. 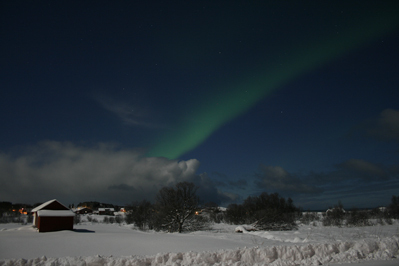 With bright moon light and many beautiful clouds the auroras are visible between the snow showers for short moments. December starts well. At first we saw a faint bow low at the northern horizon, almost without color. 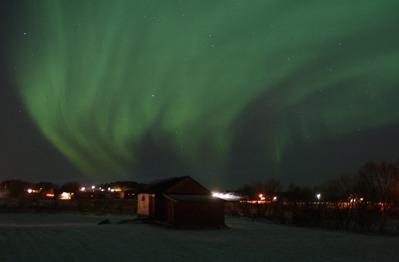 Around 21.00hrs the auroras became much better visible from east to west, less static and sometimes moving. 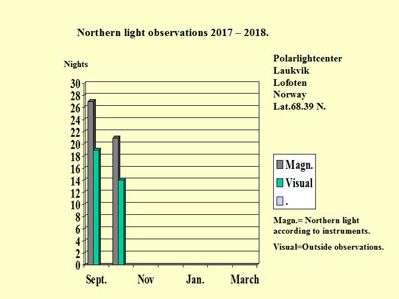 November was a good month and had 27 nights with northern light activity (grey line) on the instruments and 21 nights with visible auroras (the green line) here in Laukvik. 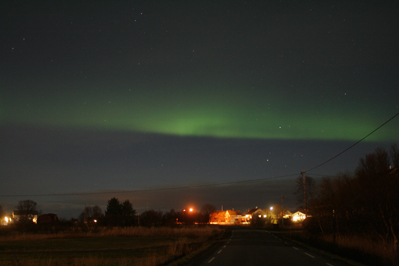 Compared with the month October, November was more cloudy but showed anyhow nice visible northern lights. 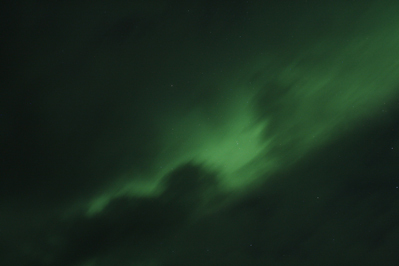 It was not easy to take a picture of the northern lights during the stormy weather. 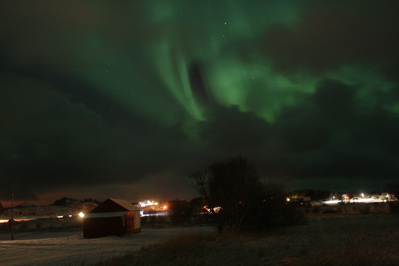 The whole evening the auroras were active but were often hiding behind the heavy clouds. At first also pink coloured behind the clouds in the east but very soon it became clear again. The northern lights were visible in all directions and high up in the sky, sometimes slow dancing and sometimes moving very fast. 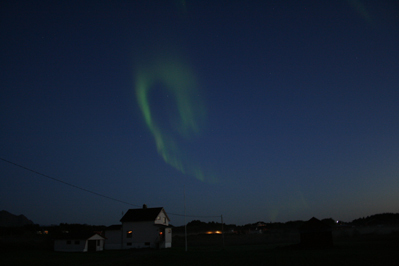 Also due to a huge coronal hole we viewed again the auroras this evening. 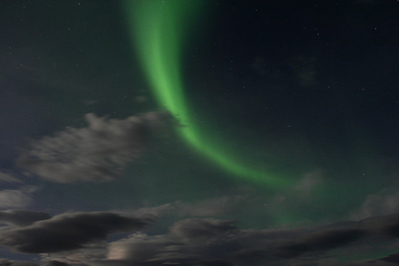 The northern lights were faint, visible in several bows high up in the sky and in soft greenish clouds. Although the weather forecast predicted a cloudy evening, there were open parts. 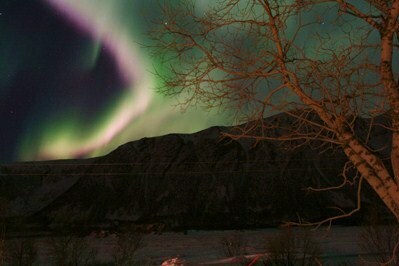 The northern lights appeared, due to a huge coronal hole. 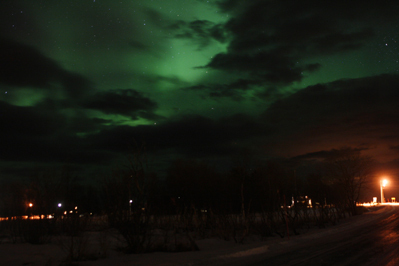 Finding a dark place to watch the auroras is the best on such a cloudy evening. On an evening like this it took quite some time before viewing the auroras. Lady Aurora decides herself when to come or to go. But if you are patient enough she will appear and is dancing for all of us. This evening we had a clear sky and a nice faint bow was visible low at the northern horizon. 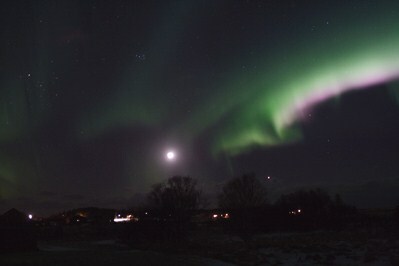 Some later the auroras got more structure and were good visible although the moon is still bright. For short moments there was some activity on the instruments. 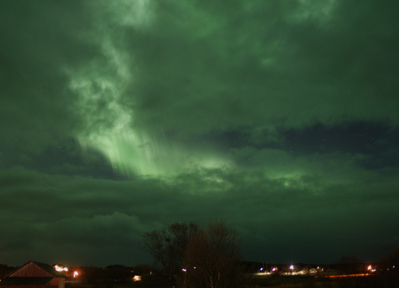 With all those clouds it is not easy to see a glimpse of the auroras. For some minutes it happened. Some days with many rain showers. 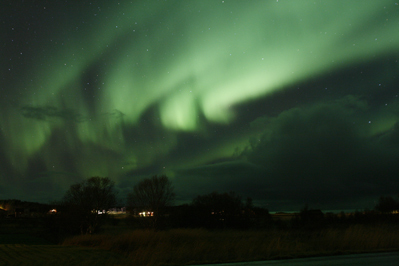 Fortunately in the evening many open parts in the sky and between the clouds the auroras appeared. A nice evening on the beach under the moon light. 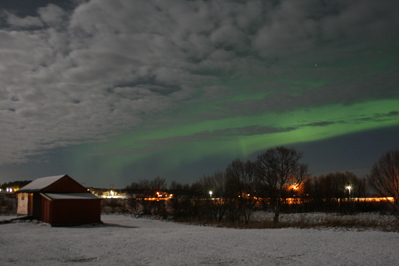 Although the sky was cloudy, low at the northern horizon it was clear and the auroras were visible. 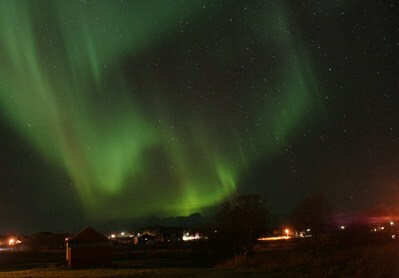 Unfortunately the northern lights were not visible anymore although there was activity enough. 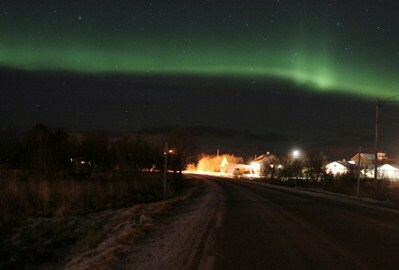 Today the northern lights started very early, around 17.00 hrs loc. time. Active auroras also to be seen in southern direction. 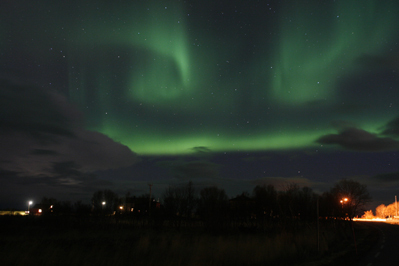 Later this evening some clouds came in but the auroras were bright enough to be visible. Still waiting for a cme to arrive. 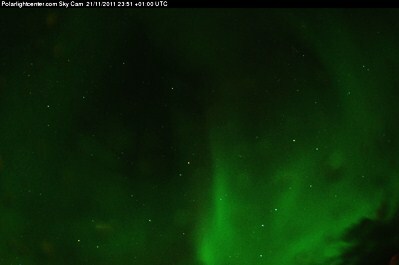 Some activity on the instruments showed nice auroras around 22.30 loc.time. Around midnight the northern lights appeared without the normal structures but as a huge faint greenish cloud in the west, north and in the east. Around 22.00hrs loc.time our instruments showed some more activity and beautiful auroras were to be seen in all directions except in the south. A huge green sea eagle was flying over Straumnes. 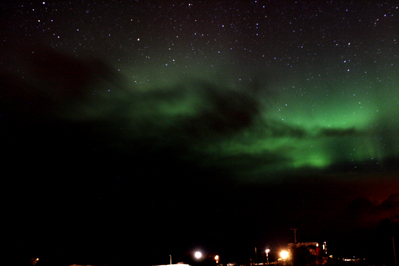 Also tonight the northern lights were dancing in the sky. And what is most important, happy people. 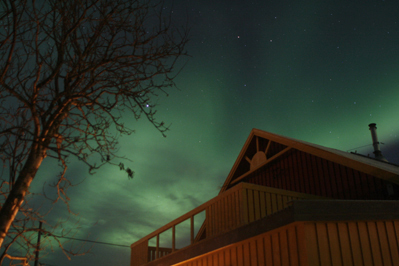 Short after the presentation faint auroras were visible in front of the Polarlightcenter. Soon after they became brighter and sometimes even pink colored and were moving high up in the sky. Great to see them for the first time in your life. Hopefully also November will be an active aurora month. This evening a faint bow was visible for some hours. Around midnight the northern lights became stronger and stronger. Moving from east to west and higher up. 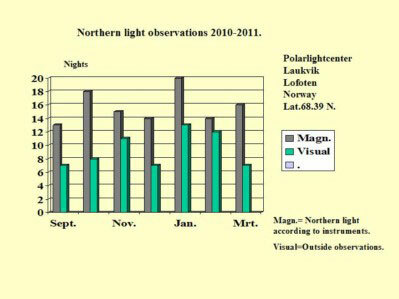 In the statistics you can read the months September and October had many nights with northern light activity. 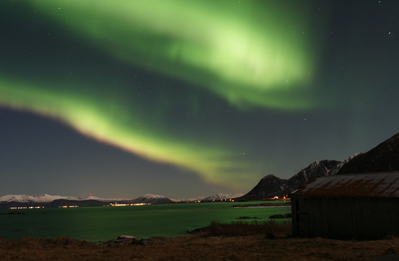 In October we had 19 nights with visible northern lights. 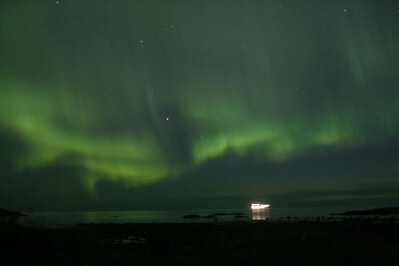 Again after some rain, bright northern lights appeared and we decided to go to the seashore. Underway the auroras were dancing in the sky. 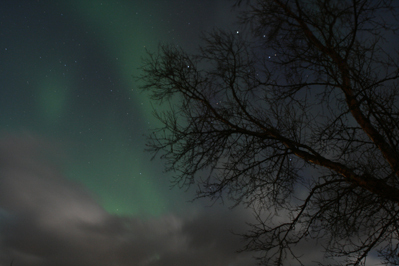 Later the northern lights were more faint but anyhow beautiful. Just after the presentation the first stars became visible after the rain showers. 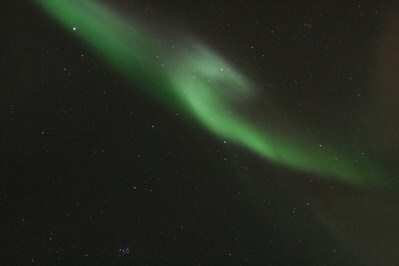 And also the northern lights appeared because there was activity enough on the instruments. 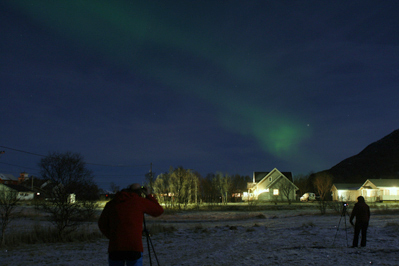 For our guests a good moment to enjoy the auroras and to practice with photographing their first aurora images. 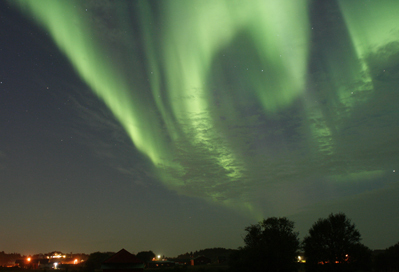 For many days the northern lights are caused due to a huge coronal hole. 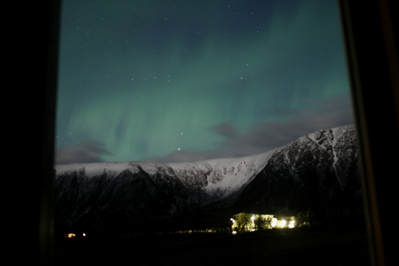 Around 22.00hrs loc.time the brightest auroras were visible. 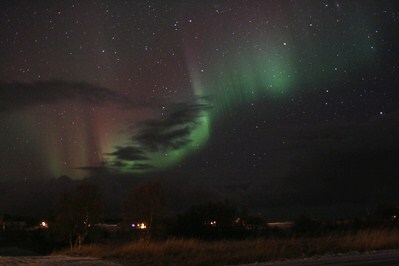 At 05.00 when I woke up pulsating auroras were visible all over and the brightest white northern light bow I ever saw. It is always hard to know there is high activity when it is too cloudy. 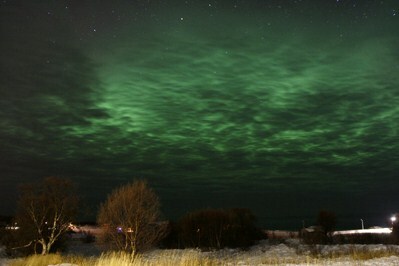 For some seconds the northern lights are visible through the clouds. 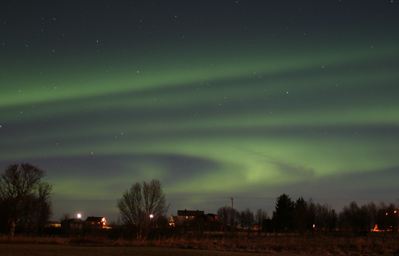 Also in the south a huge band of auroras are visible between the clouds. A great evening and again an early beginning. Auroras of all kinds, faint, bright, colorful, moving in all directions, specially in the south and even the corona appeared high up in the sky. This evening the northern lights started very early. Around 24.00hrs they were visible in the east and south because in the west it became cloudy. Around 20.30 local time low at the northern horizon the auroras were visible. On the camera also the thin clouds turned into green. Later in the evening faint northern lights were visible all over, in all directions. Tonight the auroras became brighter and brighter. 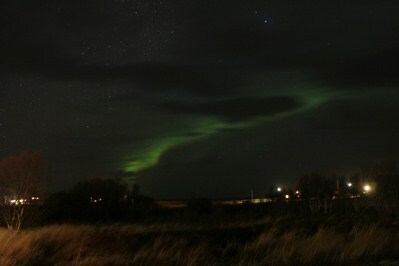 Also the clouds cleared more up and the northern lights were visible from west to east. Time to pose for father's camera. At the beginning a faint bow of northern lights was visible. 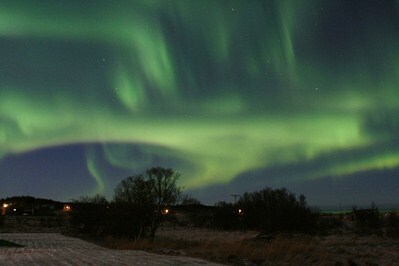 Some later the lights became stronger and in the north-north west the auroras were moving and more colorful. Tonight there was some activity but there were also many fleecy white clouds. 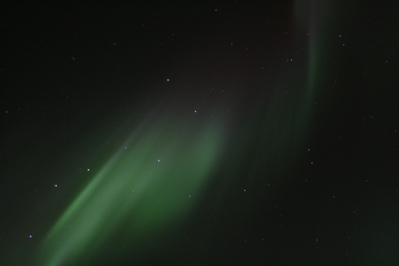 When looking outside we only noticed some flares of greenish auroras and once a bow beneath the big dipper. 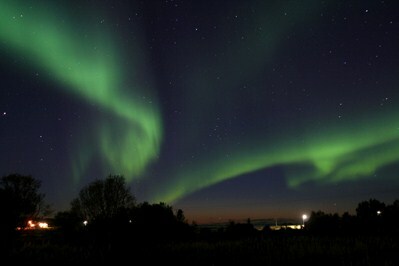 What a present to see wonderful northern lights the first evening you arrive in Laukvik. It happened to our guests. Bright and faint lights (faint by the light of the full moon), sometimes pink colored, slow and fast moving and high up in the sky. 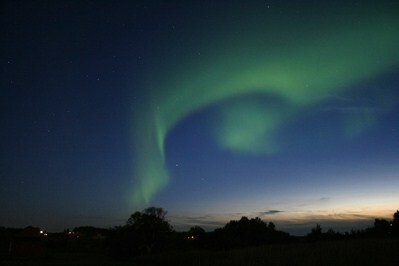 During the evening we could see sometimes a glimpse of auroras for a short time. Just around 1.00 AM (16 October) when I went to bed there was stronger activity in the east, west and even high up. Never go to sleep too early if you want to see the northern lights. We did not expect to see an open sky this evening because it was too cloudy. But it happened and the northern lights were visible for a short moment. The northern lights started very early this evening. 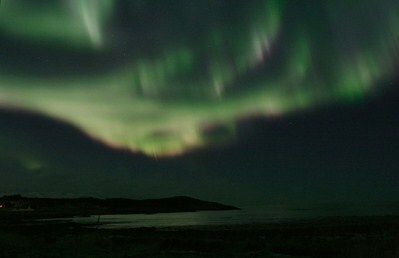 We went to the sea shore and the auroras were amazing. Fast moving, pink colored and gave a nice reflection in the water. We feel so grateful to live here up north and to see the nature's beauty. 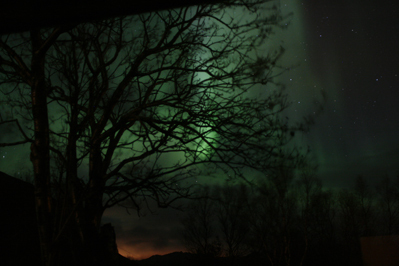 Also this evening the northern lights were dancing in the sky. Hopefully all our guests who are staying elsewhere could enjoy it too. During the presentation a faint bow was visible at the northern horizon. Just after the presentation a sign of an instrument on the monitor in the presentation room showed activity so we ran outside. 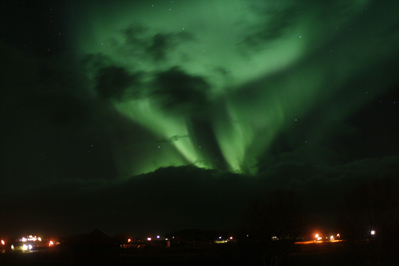 Because of the foggy dew, the auroras had an even more special and mysterious appearance. 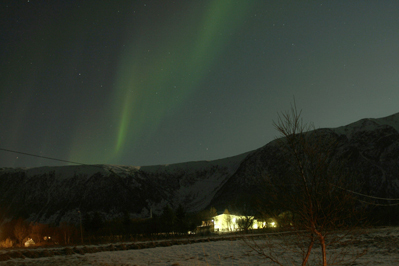 Again tonight visible northern light. Sometimes faint and around 22.30hrs loc. time for a short while very bright and even colorful. The last 10 days we had northern light activity from coronal hole effects. Today we had a sunny day and a clear night. We need a clear sky for viewing the northern lights. Last nights there was quite some activity due to a coronal hole and tonight our guests could enjoy the auroras for the first time. Tonight again aurora activity now caused by a coronal hole. The speed of the solar wind was high but the density low. Late afternoon there was already activity on the instruments. It is hard to wait until it is getting dark. It was worth waiting because the auroras were so beautiful tonight. 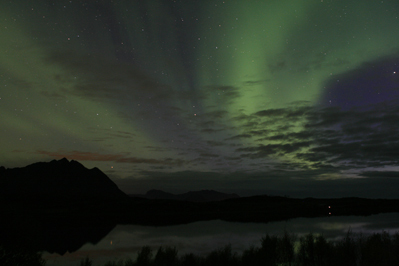 We had to wait for darkness and in the west/south-west an open part in the sky showed the first auroras. 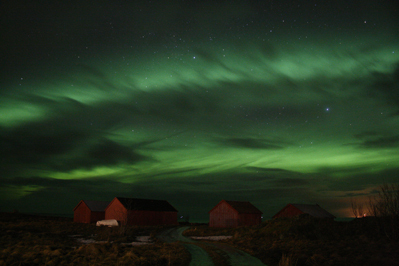 Some later the northern lights were dancing all over above Straumnes. Two nights in a row a cloudy sky. That's hard if you know there is northern light activity. Last night I woke up around 02.45 and as always looked out of the window. 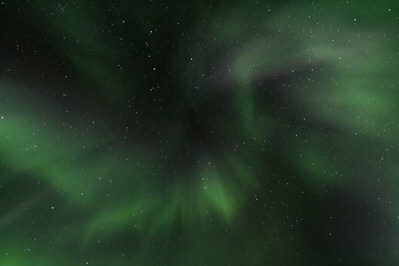 Yes, the sky had cleared up and pulsating auroras were visible. Until 04.00 I was outside. 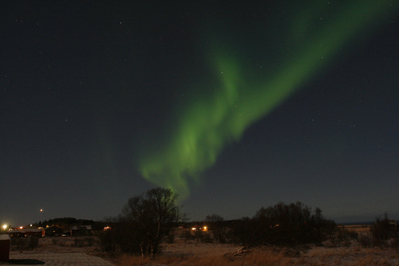 White (pulsating) auroras sometimes visible high up in the sky in a quiet and relatively warm night. Bright moon, high humidity and great auroras tonight. A sunny day and a clear evening. Low at the northern horizon a greenish bow of northern lights appeared. 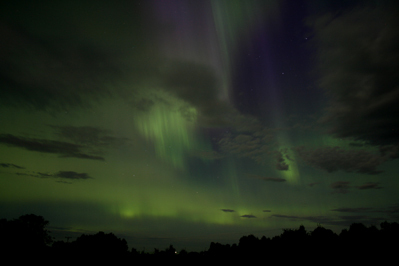 Because of the bright moonshine and the low activity the auroras were faint but anyhow visible. 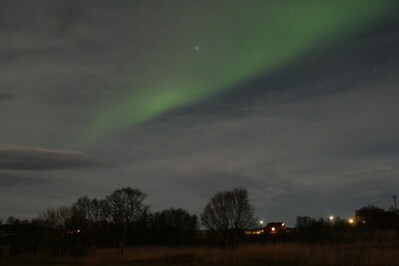 It was a beautiful evening with bright moonlight and some auroras although the activity was not high. Tonight it became cloudy but around 23.00hrs. some open parts appeared. 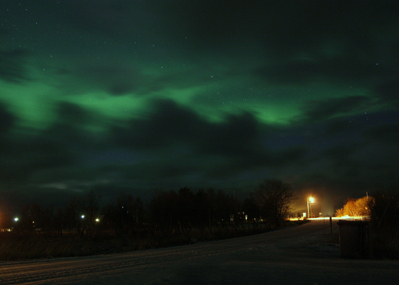 During some activity the clouds turned into green and in the north and higher up the auroras became visible. Just after the presentation faint northern lights were visible as a bow above the northern horizon. Around midnight I took this picture in front of our centre while Rob was on the beach with our guests. They were very happy to see the beauty of Lady Aurora. This evening we had a lot of rain showers. 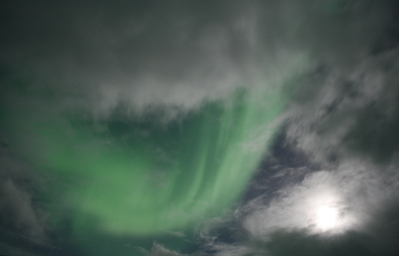 Between the clouds open parts appeared and for short moments the northern lights became visible. 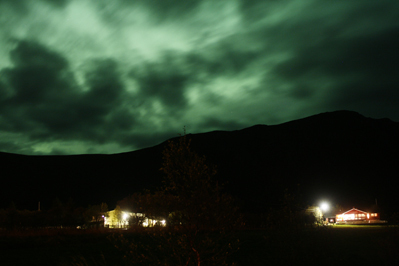 The night before we had a magnetic storm but it was too cloudy to see the auroras. This evening we were more lucky to see first faint, soon after pink coloured and for quite some time moving northern lights. 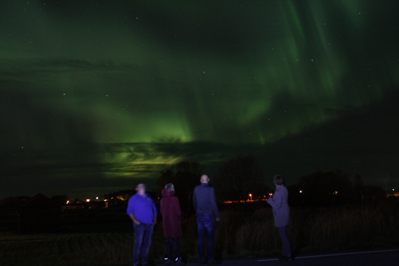 It was a nice welcome to the Dutch aurora lovers on their first evening visiting again this beautiful spot in Laukvik. This evening around 22.45 hrs. 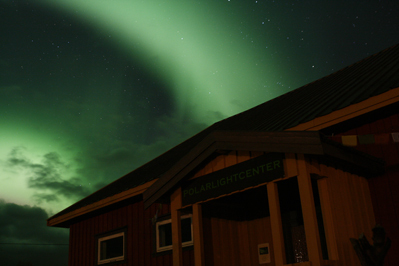 the first northern lights were visible around our centre. It was exciting to see the auroras dancing again after 5 months. 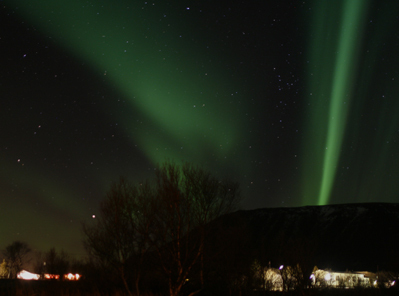 The nights will become darker from now on and we are happy to see the stars and the beautiful northern lights again. 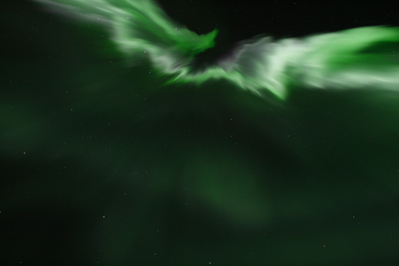 While watching the auroras a small owl was flying low overhead. A good sign for celebrating this new season. Please, be welcome to our Polarlightcenter! The grey lines show the magnetic activity during this season from September 2015 until March 2016. About 21 nights per month. 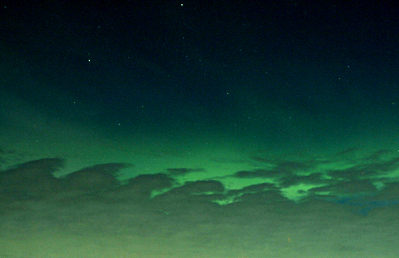 The green lines show the visibility of the northern lights due to the weather conditions. Note: the weather conditions per month will be different every year. 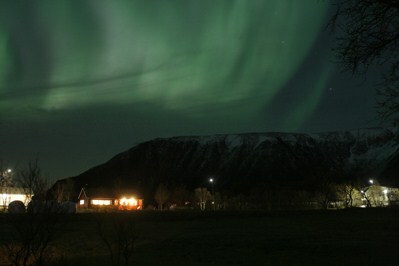 In April the sky is not pitch dark anymore and we have to wait quite some time until the northern lights are visible. 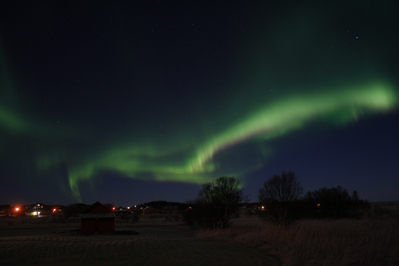 Yesterday and this evening great auroras were visible. 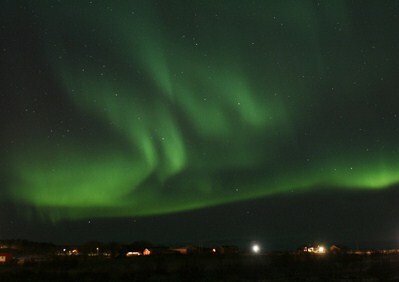 The whole west sky was filled with moving and dancing northern lights. 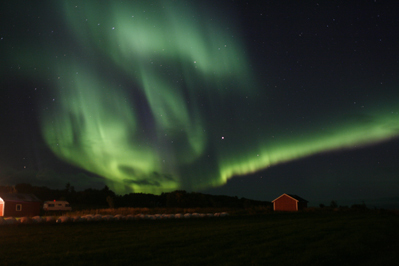 Although the Sun is quiet, these auroras are caused by a large coronal hole. Although the sky was clear enough we had to wait quite some time before the activity showed up. Around 22.45 hrs. 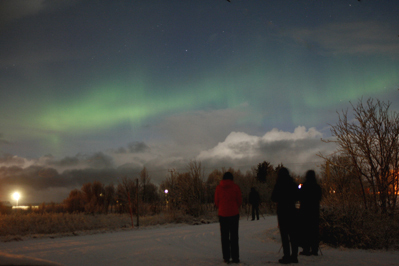 we enjoyed nice auroras for about one hour. 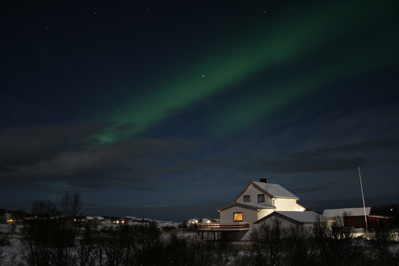 On a beautiful clear evening and with bright moonlight the auroras were visible, sometimes faint or more bright. Also in different forms and directions. Happy people who could see them on their last evening before traveling home again. A gray day and a cloudy evening. 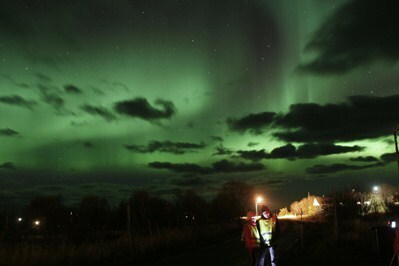 Around 22.00hrs strong activity on the instruments and behind the clouds the northern lights lighted up the sky. But our guests saw more open parts after midnight, even the moon and also some red northern lights was shown on their pictures ! Tonight the new moon is visible again. A bright band of northern lights from west to east. 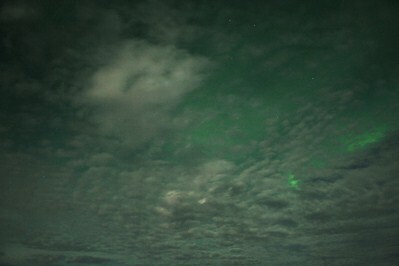 Short after, the moon was covered by some clouds and the northern lights were sometimes faint or more bright visible. Although the weather forecasts prediction was cloudy for tonight, we had a clear sky. Although the spaceweather forecast was "quiet" for tonight, we had amazing bright, moving auroras which lasted the whole evening. 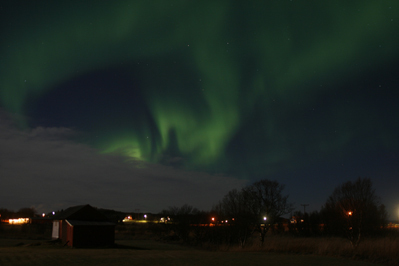 Although the solar activity was low, the northern lights were visible almost the whole evening. 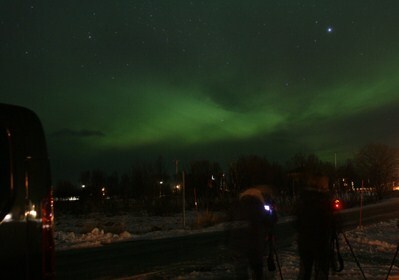 We took a long break in the presentation because viewing the auroras was of course most important. 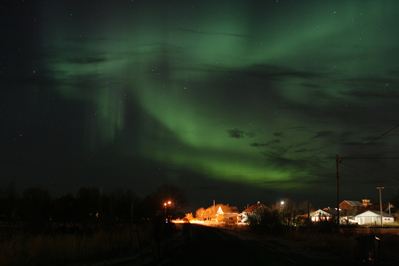 During and after the presentation the auroras were visible. First very faint, later some bows were visible at the northern horizon. When we went to the beach it is always nice to be there. 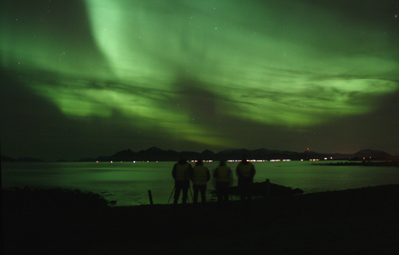 The auroras, some falling stars, the sound of the sea and happy people. This evening the auroras started very early. 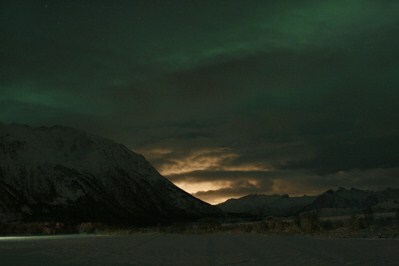 When it became darker the northern lights were visible in all directions and high up in the sky. Our Japanese guests were photographing at the east side of our centre. When I saw the picture I took of them It reminds me of a old Japanese print. 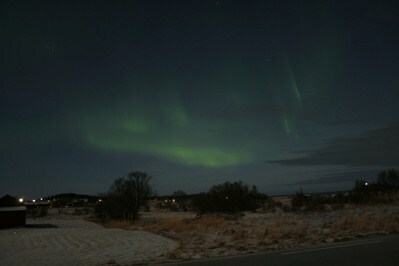 The second picture I took earlier when the auroras were much brighter. 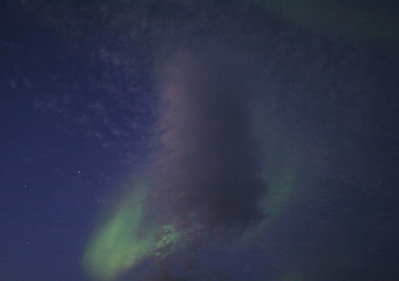 clouds the auroras were visible, sometimes faint and sometimes more bright for short moments. This evening the sky was cloudy and we had some snow. 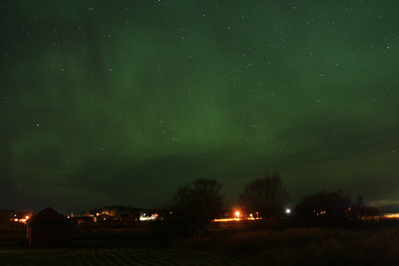 The activity was low but around 22.00hrs we could see a small band of faint northern lights at the northern horizon. Low activity but a clear sky. Just before the break during the presentation we could see a faint bow of northern lights from west to east. After the presentation again we saw faint auroras with some small black clouds in between, the Pleiades (or the seven sisters) and the sky full of stars. 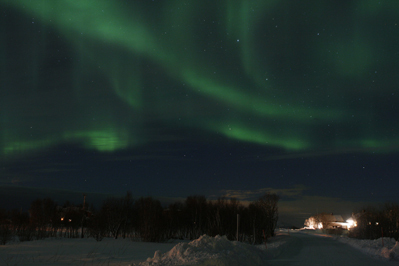 Also the last evening of February we enjoyed beautiful auroras. 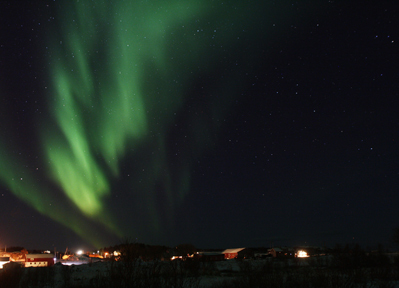 Sometimes fast moving and colourful northern lights from West to East. The sky full of stars makes this evening brilliant. 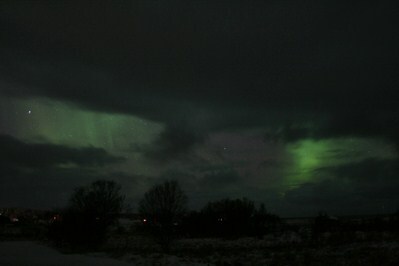 After 22.00 hrs there was some activity and between the clouds the auroras were visible. A group of photographers and other guests who liked to take pictures were lucky tonight. During and after the presentation the northern lights were very bright visible although the activity was low on the instruments. We had a sunny day with a clear evening. The activity was low on the instruments and just after midnight the auroras appeared high up in the sky from east to west. Not strong but nice to see in the moonlit night. 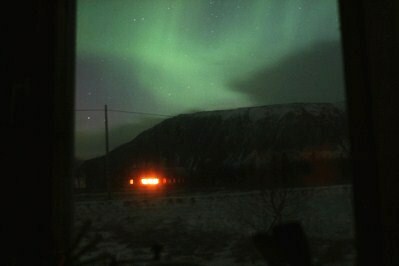 On the monitor in the lecture room we could see the activity of the auroras. 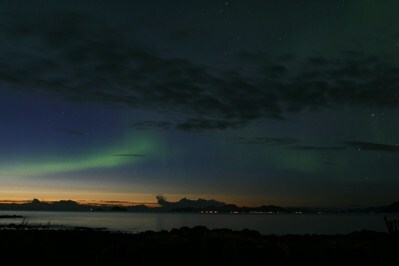 We had to wait for a clear sky and around 22.05hrs we could see the northern lights in the north-west. Nice moving northern lights in a not totally clear sky. Beautiful enough when you see the first auroras in your life. This evening the full moon was "shining" bright. 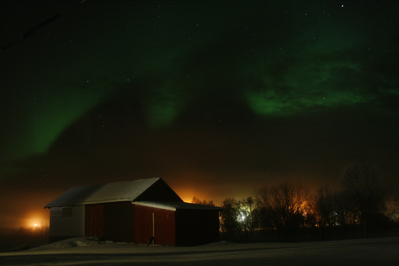 The auroras appeared for a short moment and because of the low activity the visibility was not optimal. 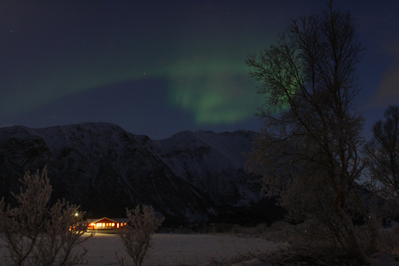 When I woke up around 01.20 clear moonshine and in the north-west active northern lights were visible. 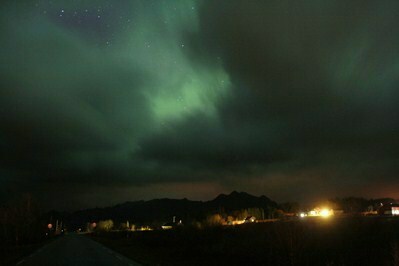 After wakening up two of my guests, unfortunately, the activity became weaker and we could see only a few glimpses of Lady Aurora. 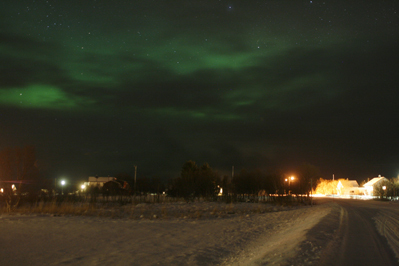 Our other overnight stay guest did see, just some minutes before, the moving auroras and took some nice pictures. 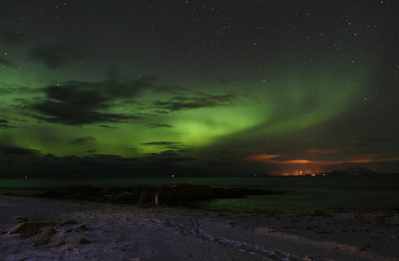 Waiting for a CME to arrive, later this evening the auroras appeared between snow showers and clouds. Together with bright moonlight it was a special evening. 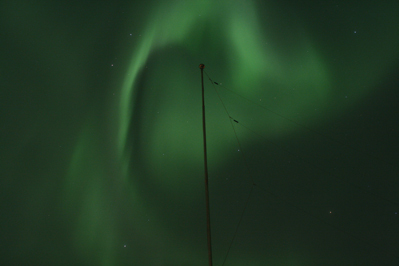 Although the activity was very low (Kp 1) we enjoyed nice, strong moving and even pink colored auroras this evening. During the presentation faint auroras were visible and after the presentation the northern lights became stronger and stronger. For our guests nice to see and to photograph. 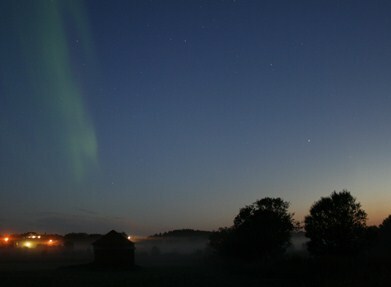 Suddenly the fog appeared which gave an even more mystical touch to the auroras. Some time later the night sky was clear again. 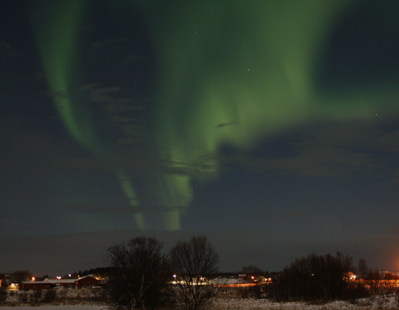 Around 18.00 hrs this evening the auroras were visible in the north. We went to the beach to enjoy the lights close to the sea. The clouds are coming in some later this evening. This evening the northern lights were first visible as a faint bow. Later more bows above each other and around 22.00hrs loc.time the auroras became higher up and some times brighter and even pink coloured. 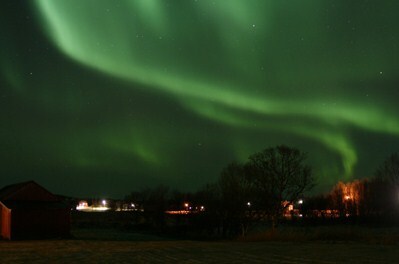 I woke up at 04.15 hrs and saw huge and faint northern lights out of the window from the south side. The northern lights had no colour but the stars were shining through. An amzing sight! Like the weather forecast predicted, it should be more clear in the evening. 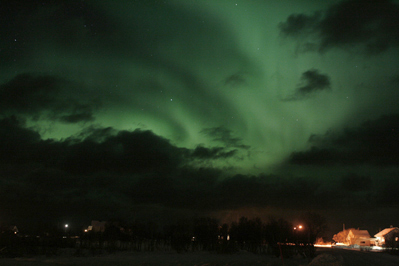 The clouds opened up for some hours and the auroras were visible in the west and north-west. 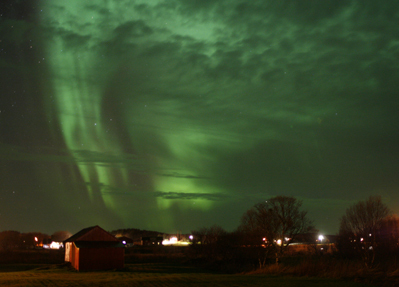 After midnight the auroras appeared as a surprise. The instruments showed hardly activity and the Kp was very low. In the starry night the northern lights were faint but beautiful. The red colour though was hardly visible but showed on the picture. 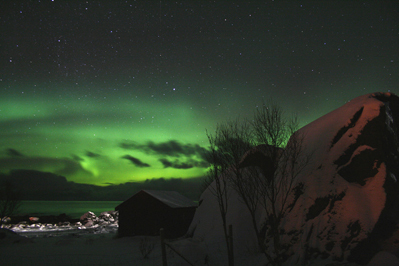 January started so well with lots of clear days and nights and nice auroras. 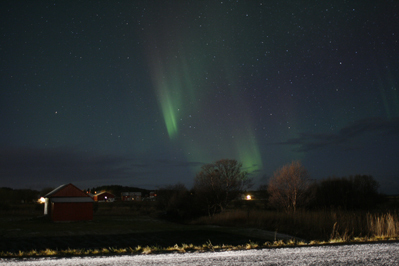 Today we had a clear day again and the auroras were visible very early and lasted for many hours. 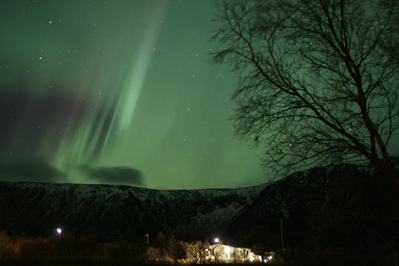 Around 20.00 hrs nice auroras were visible high up in the sky. Between many clouds and moonlight a strong moving band of northern lights was visible during a short moment. Short after it started to rain. 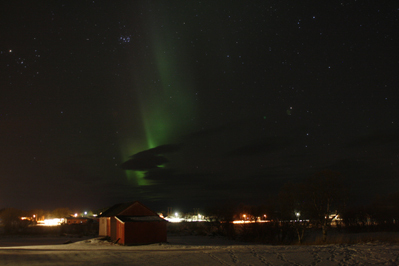 At 16.30 hrs the auroras were visible after some hours of activity on the instruments. Clear sky and a bright moon together with northern lights above a great white landscape is like a fairy tale. 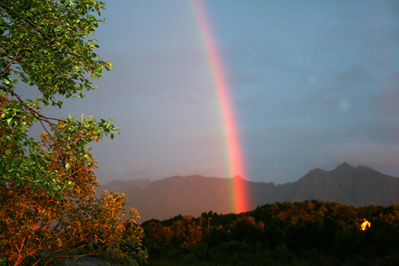 Early in the evening, like last evening a bright bow was visible low at the northern horizon. Around 22.15 hrs the instruments showed suddenly more activity and when I opened the front door of our centre this display was our view. For a short moment is was moving very fast and pink colors were visible. 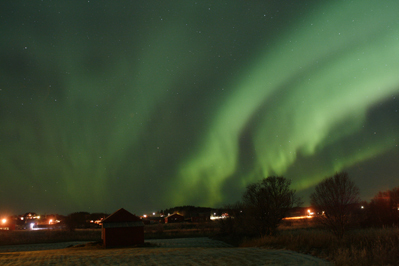 Also the auroras appeared high up in the sky. First we had to deal with the clouds this evening. 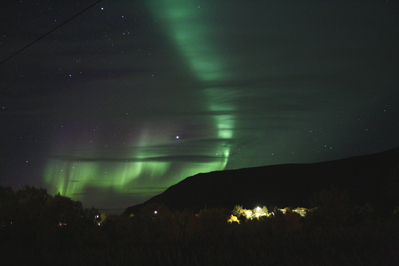 Later the stars became visible and faint stripes of northern lights due to the low density solarwind. 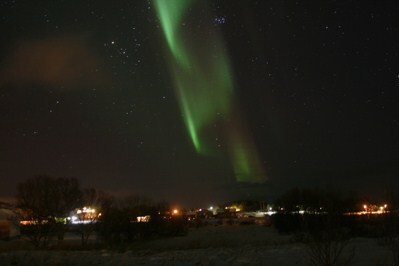 When I wake up at 05.00 hrs this morning I saw through the window white pulsating auroras. The instruments showed they had been there all night. A nice bow low at the northern horizon. 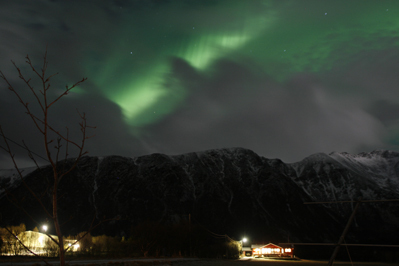 Soon after, on our way to the beach, the snow appeared and covered lady Aurora with a white veil. Nine nights in a row lady Aurora is pleased and willing to dance for us in the freezing cold. She seems not to be tired. 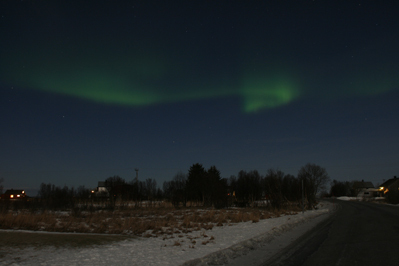 Also this evening the auroras were visible for a short moment. For more than one week we have clear days and nights. But when lady Aurora appears it gives you a warm feeling. 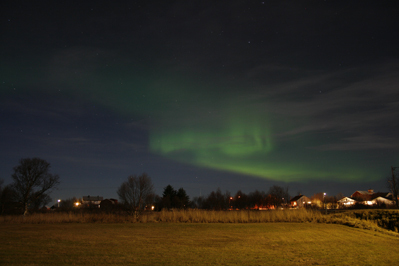 Also this evening the auroras were visible. Sometimes faint and sometimes stronger. Like this display from around 23.30 hrs. 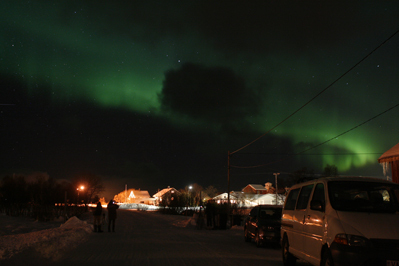 During and after the presentation the northern lights were visible around our centre. 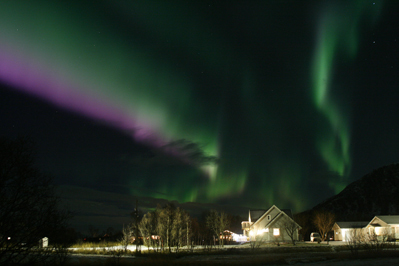 The aurora display was huge and had less colour due to the low density of the electric particles in the solar wind. 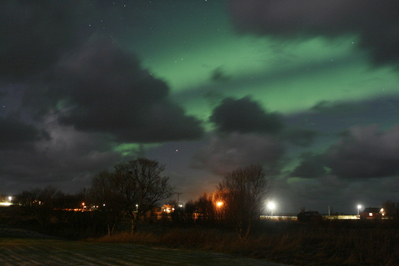 Around 20.45 hrs the northern lights were visible for a short moment. From the same coronal hole we are enjoying the auroras three nights in a row. The weather forecast predicts many clear days and nights. 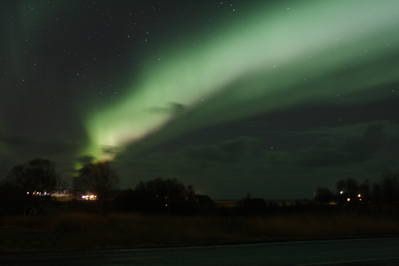 This evening the auroras were visible all over. Sometimes faint, sometimes strong, in all directions and high up in the sky. A clear day and an evening with a sky full of bright stars. The northern lights were first visible as a faint bow. For a short moment it was more dynamic low at the northern horizon and more faint some higher up. 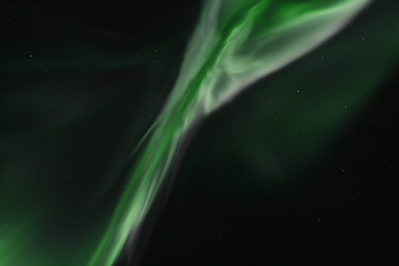 These auroras were an effect of the solar wind from a coronal hole. Old years eve there was strong activity but it was cloudy. Around midnight all kinds of colour appeared in the sky to wish that all of us try to make a better world in 2016.
north, later from west to east and for a short moment more active in the west and higher up in the sky. 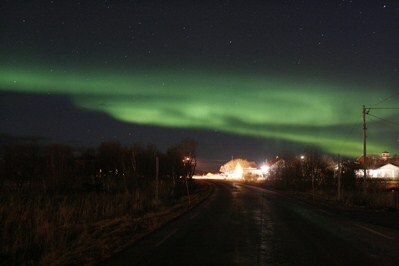 While looking at the auroras a huge fire ball crossed the sky from south to north. Amazing! Today we had a beautiful clear sky with pink colored clouds and stripes. At about 16.10 hrs. loc time a faint bow of northern lights was visible low at the northern horizon. Some time later there was more activity but unfortunately it became cloudy again. 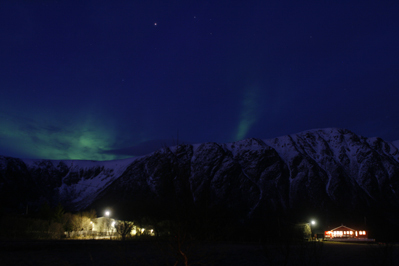 This afternoon the northern lights started very early, around 16.00hrs. loc.time. At first as a sharp bow, low at the northern horizon. 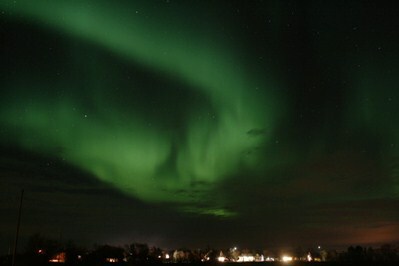 Later the auroras were visible all over. 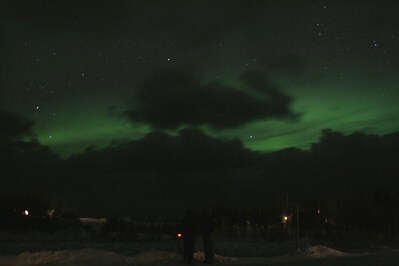 Two hours before the evening presentation started, the instruments showed some activity and the northern lights were visible between the clouds. Unfortunately they did not show themselves anymore because it was not clear enough during the evening and the night. Just after the presentation a faint bow of northern lights was visible. Anyhow good visible on the pictures some of our guests took. 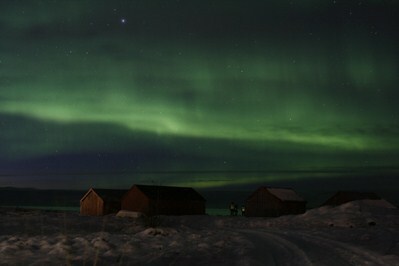 A half hour after the guests left, the activity became stronger and brighter auroras were visible. 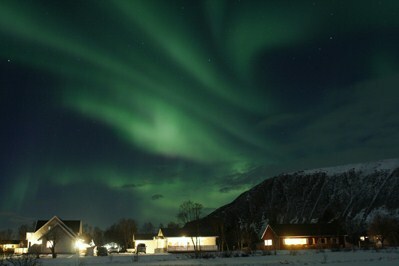 Hopefully our guests could see them also after sending them the northern light sms-alert. When I took this picture the first raindrops appeared and short after it was cloudy again. 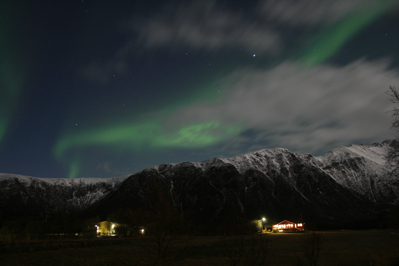 Very early the northern lights are visible, around 17.30 hrs. loc. time. This evening around 21.00hrs loc. 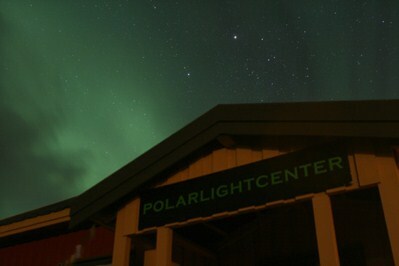 time strong activity on the instruments (K5) and the northern lights were visible at the south side of the Polarlightcenter for a short moment. Around 22.15 loc. time beautiful auroras were visible between the clouds and the rain showers. 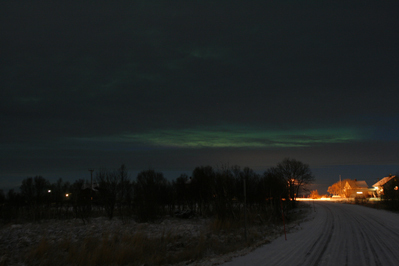 The snow had melted away and some frost reflected the northern lights on the road. The last days the Sun is not very active. 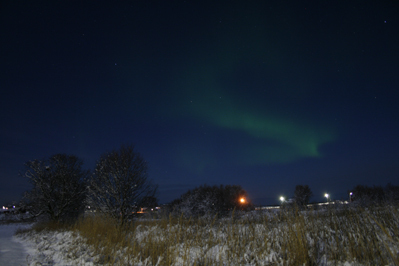 This evening the northern lights appeared anyway in a clear sky. First low at the northern horizon as a bow and some later higher up. Because of the bright moon and the low activity (Kp 1) the auroras were faint to see for our eyes but good to see on the pictures. Yesterday and this evening beautiful auroras from a coronal hole. The activity was not strong but the auroras were moving, had different forms like bows and curtains, were faint and sometimes pink coloured. 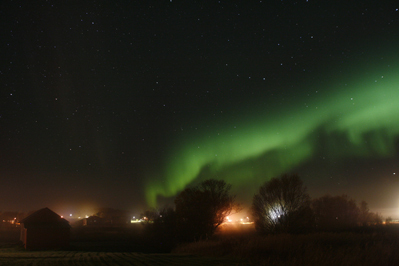 This evening the auroras showed up around 22.30 hrs. loc. time between the clouds and the heavy rain showers. It was lady's Aurora goodbye to our guests on their last evening. 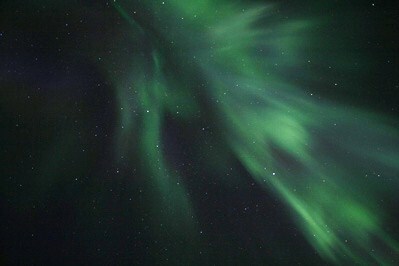 The instruments showed an magnetic storm early in the evening. 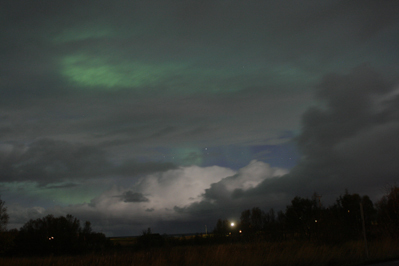 Clouds and rain showers did not hide totally the auroras. In all directions even in the south the northern lights were shimmering behind the clouds. 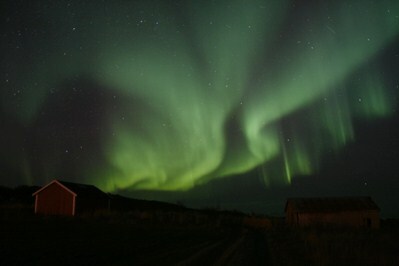 Later after midnight our guests saw clear sky again with even pulsating auroras. 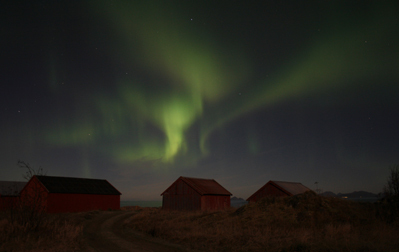 Last nights we enjoyed the auroras from the same coronal hole which effect caused the northern lights on 9 October. 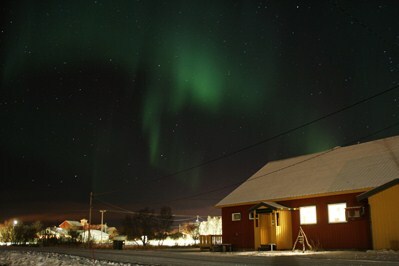 In between and after the presentation the northern lights were visible around our centre. 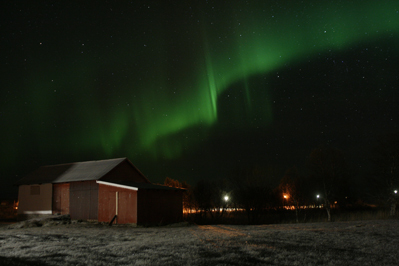 The auroras were faint because of low activity and of the bright moonlight. Short after midnight suddenly more activity on the instruments and much stronger and pink colored northern lights were visible for a short moment. This evening there was low activity on the instruments. At around 20.00hrs a faint bow was to be seen, low at the northern horizon. 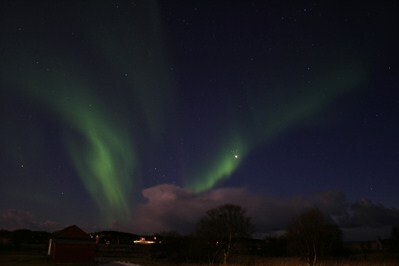 Nice auroras were to be seen around 20.45 hrs. loc. time. A huge bow from east to west and a clear moon in the south. Meteors from Halley's comet were also passing. The picture of the night sky camera shows one of them. It is such a beautiful evening! 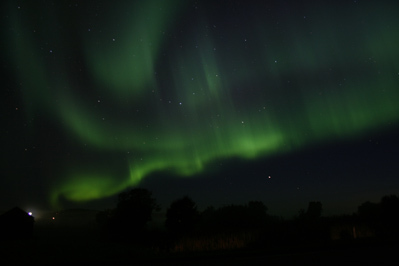 Although the air is very humid the northern lights were visible high up in different directions. Today we had a lot of rain. This evening too, it was cloudy all over and the wind became stronger. It happens often that on an island, close to the sea, the sky clears up. 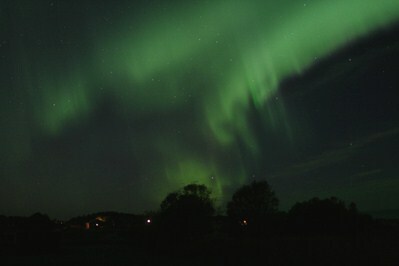 Like tonight and beautiful auroras appeared. A moment of clear sky. The instruments are showing low activity. At the northern sky faint auroras are visible. For untrained eyes it is difficult to recognize it because the northern lights are without color. 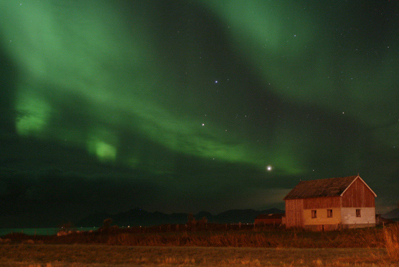 To know if you are looking to the auroras: you should see the stars shine through. 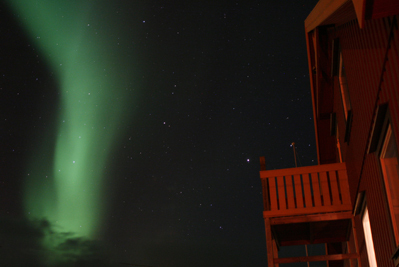 A young lady, traveling alone all the way from HongKong, was so excited to see her first auroras. 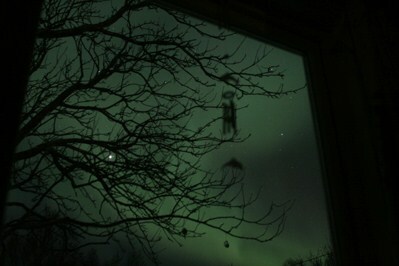 She just learned how to use her camera and took the first shot of the auroras. Her first photo seemed to be the best because the northern lights were then so bright. Later this evening the clouds came again. After a week with sunny days and clear nights the weather changed. Rainy days and cloudy nights. Due to a huge coronal hole we could see the northern lights behind and in between the clouds. For one moment fast moving and even pink colored auroras. It was amazing to see the different colors in the bright and moving northern lights. The painter added not only different green colors but also orange, yellow, pink and even red from his palette to create the auroras. It was an unforgettable evening. This evening the northern lights started again very early. Fast moving and amazing pink colors were added to the painters palette. 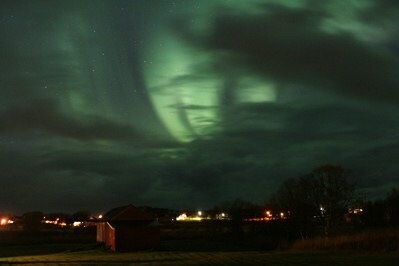 Again tonight fantastic auroras. 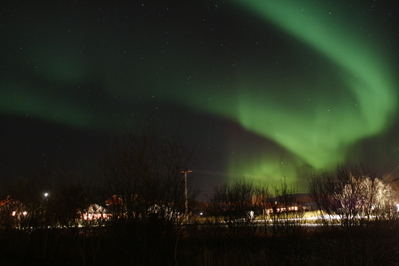 The northern lights were so active, early in the evening Kp 7 and later Kp 6. 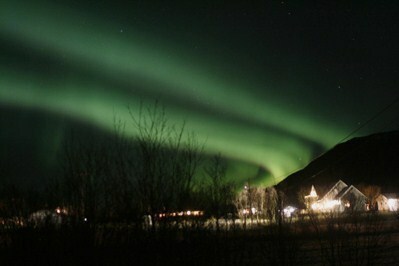 Because of this activity the auroras were to be seen to the south. Even in Great Britain and in north Germany. This time of the year when the northern lights start early, the seashore gives a palette of different colors. The orange glow of the Sun, the faint green of the auroras and the different blue colors of the sea waters and the sky. 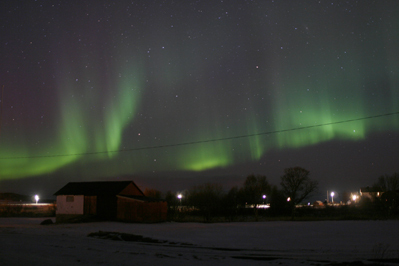 Around 20.00hrs the northern lights were visible, first as a bow at the northern horizon but soon after higher up. 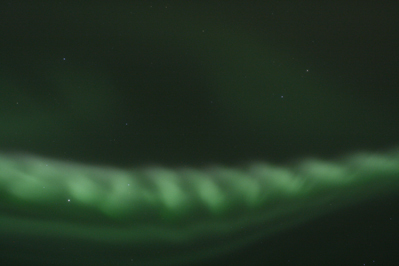 The auroras stayed faint but had beautiful structures. Even late at night there was a huge bow from east to west with vertical lines in it. 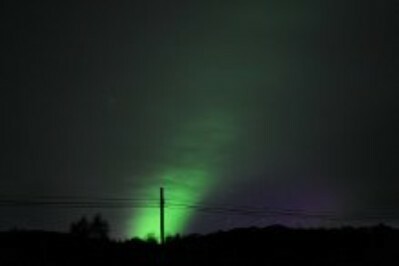 This evening the sky became clear and at the beginning faint northern lights were visible. 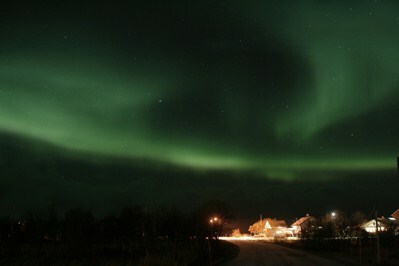 During the evening the auroras became stronger and stronger. Even colourful and fast moving above our heads. 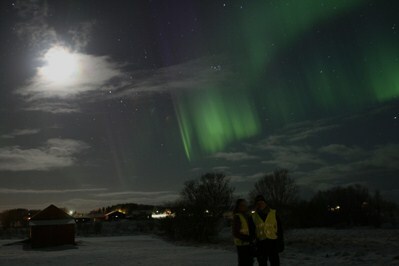 Around 0.30 hrs loc.time the auroras and the bright moon were wishing us a good night's sleep. Again the sky was gray this evening. Without seperate clouds and no stars were visible. At around 23.10 hrs. 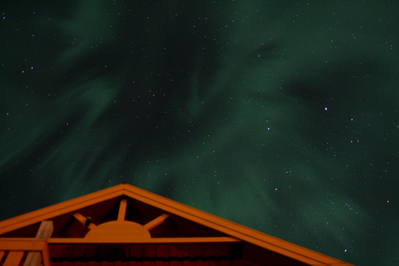 loc.time above the roof of our centre the northern lights became visible and some faint stars from behind the clouds. On the Lofoten islands and close to the sea, on a cloudy evening you can see open parts in the sky from one moment to the other. If there is activity on the instruments we are lucky to see the northern lights for short moments. The weather forecast predicted clouds during the lunar eclipse. I took a test with my telelens and photographed the full moon around 22.00 hrs. loc. time: F11-ISO 200 and 1/160 sec. At the beginning of this evening the moonlight was very bright and the northern lights were beautiful but faint. Later in the night the moon was hidden behind the mountains. 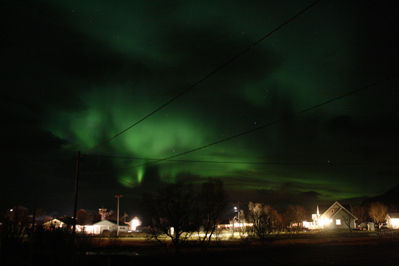 Also the street lights are turned off after midnight and Lady Aurora was happy to dance again in the dark night. Short after the presentation we saw a faint bow of northern lights at the northern horizon. The sky cleared up and the stars were twinkling bright and even the milky way was very good visible. 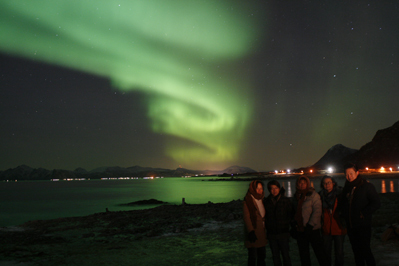 On the beach we could enjoy even more northern lights and our guests and we felt grateful and happy. Tonight active auroras around 23.00hrs loc.time. On my way to the sea shore the northern lights became fainter very soon after. On my way back I enjoyed many bright stars and several falling stars. In the old days people believed it should bring luck and a good catch while fishing under the northern lights. Short after mignight they became faint again. (CH 689) earth directed four days ago. Short after the presentation one of our guests looked outside and noticed the fog was disappeared higher up and we all could enjoy beautiful northern lights. 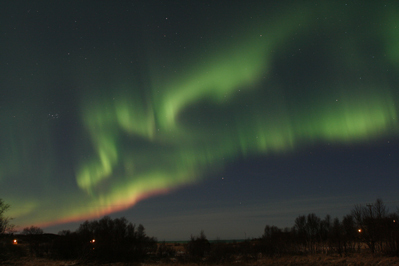 The auroras (Kp 4) became stronger short after and lasted for some hours. 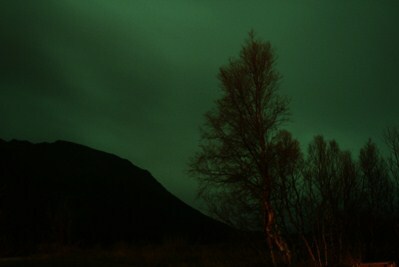 At around 21.30 loc.time the auroras were visible, even when the sky was still blue. 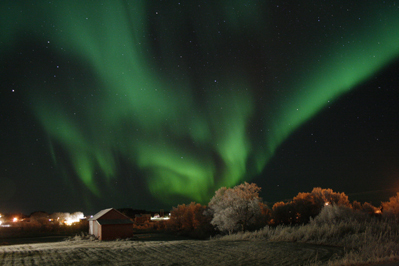 For many hours we could see the auroras in all directions. Even the fast moving and colourful coronas were visible many times. One of the strongest magnetic and current variations in years on the instruments. Shock wave for 15 min. Just before midnight local time, a shock wave appeared on the ground current instrument and northern light was visible in f.e. Finland. 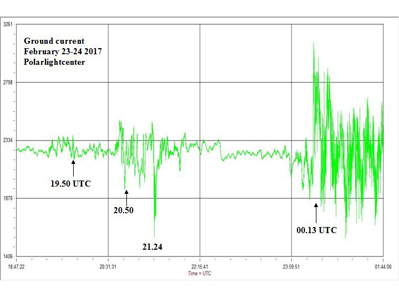 See: Spaceweather click on "surge of electrical currents in Norway"
After some weeks with sunny days and clear nights the weather changed. Gray skies in daytime and cloudy nights. This evening we had the first presentation of the new season. During the presentation there was some activity but it was still too light to see the auroras. When our guests walked back to Laukvik harbour to their ship, the Bør, a faint bow of northern lights was visible from west to east. A beautiful evening, specially with some fog which became stronger short after. 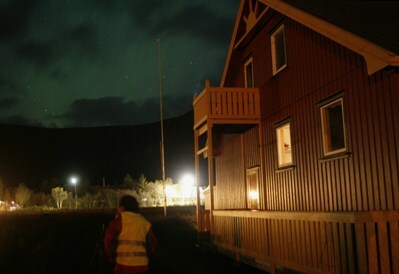 This northern light season we had many evenings/nights with visible northern light. 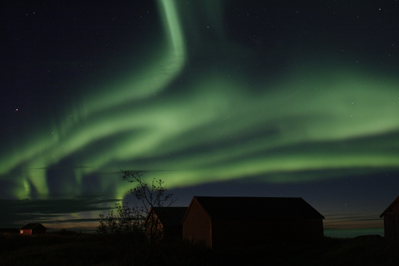 Like the statistics are showing, October was the best month to view the auroras. After several cloudy days and nights we had lots of sunshine today and a clear evening. 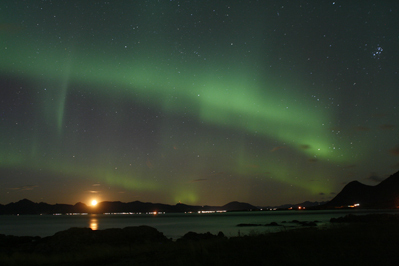 For some moments strong activity and after midnight again nice visible northern lights even in a moonlit sky. After a snowy day the sky cleared up in the evening. The moon light becomes also much brighter and shows the white landscape in all her beauty. 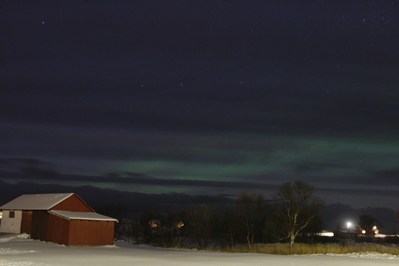 The auroras are still good visible although more faint. 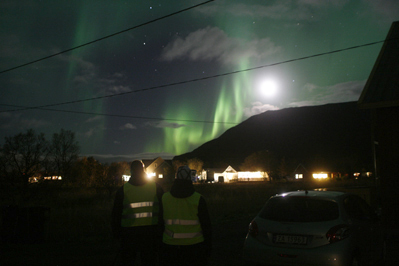 While we are enjoying the beautiful moving and sometimes colourful auroras, Rob is reading the enthousiastic text messages from guests somewhere else who are also admiring the northern lights after receiving our sms-alerts. The first picture is from 10.02 at the start and the second taken at 11.02 pm. 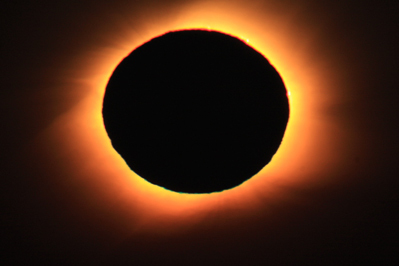 With an international group of eclipse watchers we felt grateful to see and feel this beautful phenomenon. 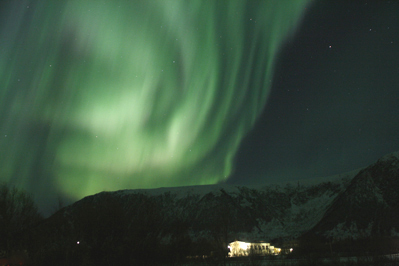 On Spaceweather: from Jan Koeman a nice impression of this morning. Strong activity due to a solar flare together with an explosion in a nearby magnetic filament. 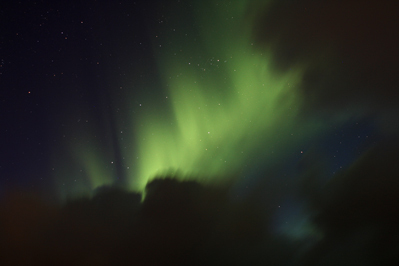 One of our guests Jan Koeman (from the Netherlands) took this nice picture from the auroras behind the clouds. 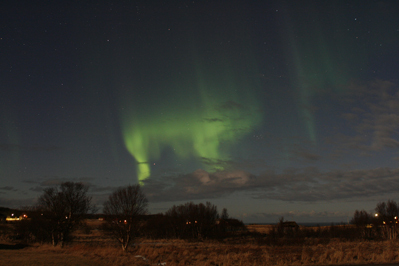 This evening the auroras started first quite faint and became stronger afterwards. A last view outside before going to bed I saw around 0.20 hrs. the biggest corona I ever saw with the big dipper as centre. Amazing to see, standing all alone outside and to hear a screaming fox nearby. 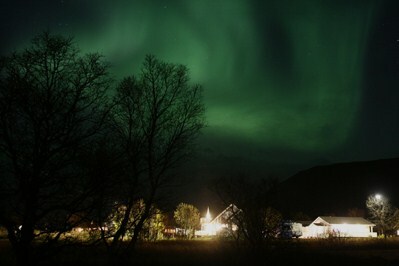 Later in the night at 2.30hrs the northern lights were still active and a part of it became pulsating. This evening the auroras were incredible. During the presentation they started faint as some bows low at the northern horizon. Later this evening much brighter, more colorful and moving very fast in all directions. Some displays were of a breathtaking beauty. 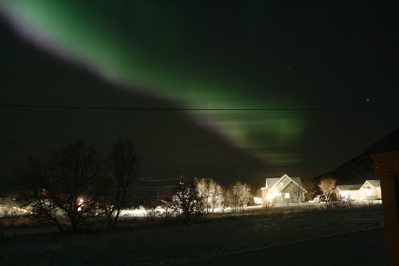 In the early morning hours at about 04.00 I wake up and saw through the window very faint auroras. 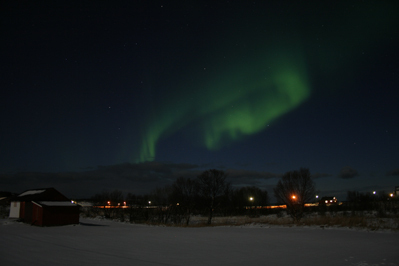 Last month we had in February 19 nights visible northern lights here in Laukvik. On the instruments 24 nights with magnetic activity. 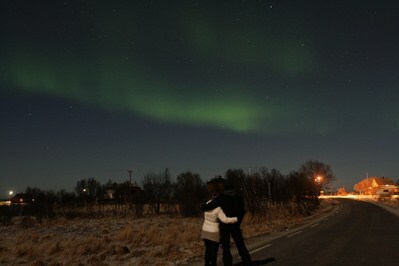 It is always nice to see young lovers looking and enjoying the auroras. It was really a surprise to see the northern lights between the clouds tonight. Today we had a daytime presentation and in the evening we went with our overnight staying guests to the beach (close by) to view the auroras. And yes, the lady was dancing again for us last night. 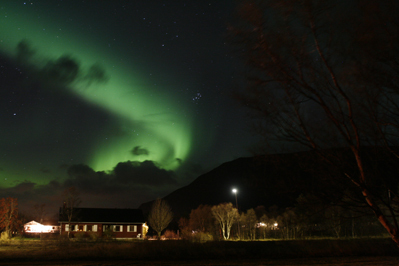 This evening and night we had a magnetic storm but is was cloudy during the presentation. 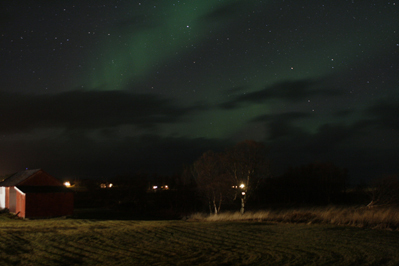 Short after we had some clear parts and the northern lights were visible. First for a very short moment because of the clouds but later for a longer time. Nice to see in the north and high up in the west. 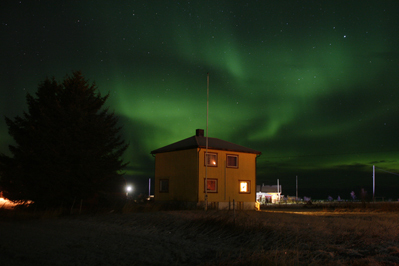 Later this night, during the early morning hours, our overnight staying guests enjoyed again the auroras. The night sky camera on the roof is repaired and gives hopefully nice images again. This evening there was low activity on the instruments but we enjoyed beautiful faint colored northern lights. The clouds came in from the south and the north, in between we had a clear sky! During the presentation there was northern light activity and we could see once the auroras between the snow and hail showers. 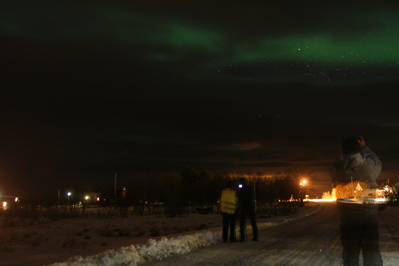 Just before midnight Rob sent the last sms-alert and two of our overnight staying guests were brave enough to go outside again in the windy and dark night to admire the auroras from behind the clouds. Yesterday we had a full storm and until this evening we were about 33 hours without electricity. 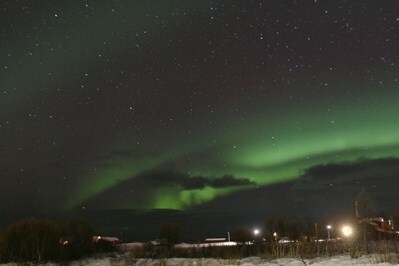 The auroras are much better visible but unfortunately the sky was not clear. Because I did not want to damage my camera during stormy weather I took a picture through the window, east directed, of quite nice auroras. The bright light out of a neighbour's house was just candle light because we were without electricity. Our overnight staying guests had more courage and were staying outside for a short while. 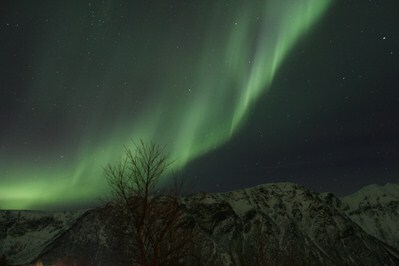 Today the auroras appeared very early, 17.30hrs loc. time. It was still not dark enough and when we went to the beach the northern lights showed quite faint, low at the northern horizon. 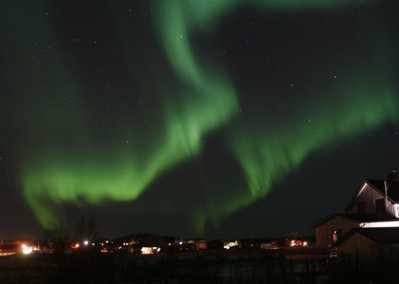 Tonight the northern lights appeared several times. Around 22.00 hrs loc. time we decided to go to the beach. 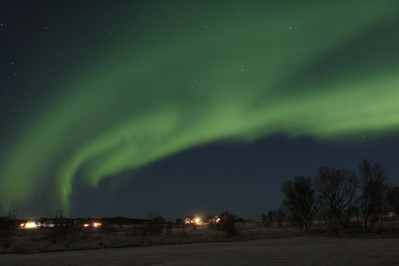 Arriving there we just could see a glimse of lady Aurora. Sometimes she is playing with us. 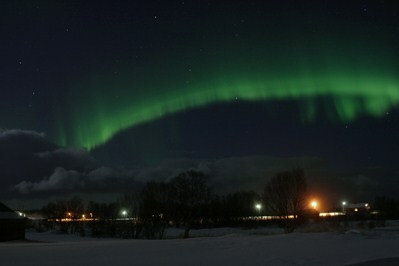 The last day of January we were treated to beautiful auroras. 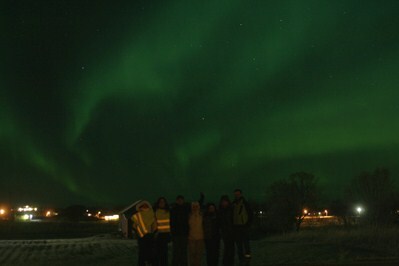 We had to stop the presentation several times to view the northern lights with our guests. Theory and practice is a good combination. 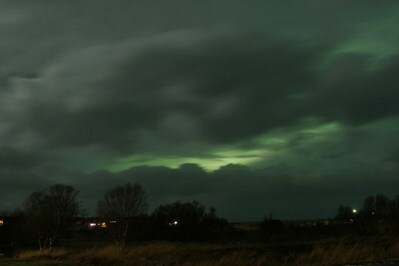 At around 19.30 hrs loc.time the auroras appeared between the clouds. Last days cloudy weather. This evening the clouds came in from the south and kept the north sky open. 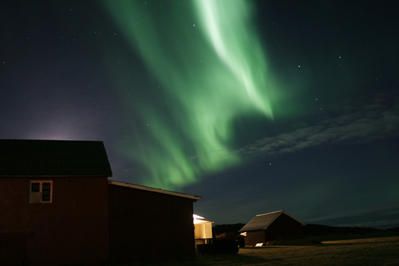 With some northern light activity the auroras were visible in a beautiful moonlit sky. 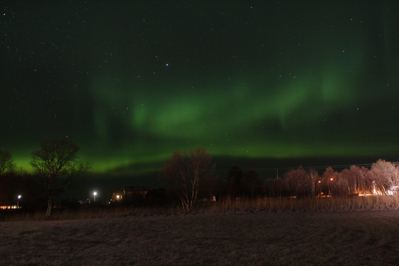 After many clear days and nights also this evening beautiful auroras over Laukvik. 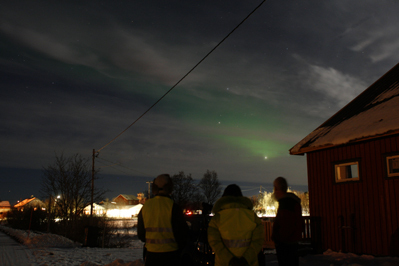 This afternoon the activity started around 16.30hrs loc.time but the auroras were not yet visible. 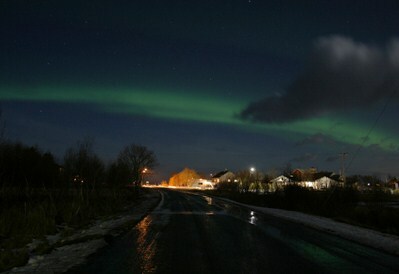 Around 17.00hrs we could see the northern lights, first in the west. The camera showed very colourful pictures with pink, red and even purple but it was hardly to see with your eyes. 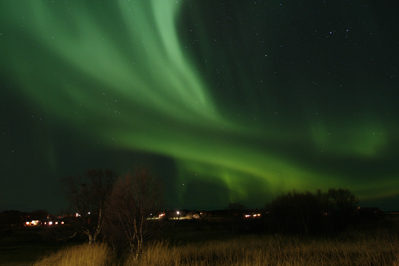 Later in the evening before midnight, the moving auroras became brighter with very clear green and pink colours. Because of a solar wind stream from a coronal hole the auroras were much brighter this evening and were to be seen for many hours. This evening the northern lights appeared soft coloured and filled the whole west sky with its beauty and low at the northern horizon a stronger bow was visible. We had to wait quite some time the activity started on the instruments. At around 23.15 loc. time in the west strong northern lights were visible. 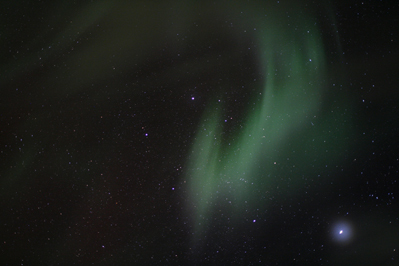 Later beautiful faint auroras appeared high up in the sky with different forms and structures. The Sun on our roof did her best while the real Sun was actually not active at all. Tonights full moon is big and bright but due to the solar wind from a coronal hole the auroras are to be seen sometimes faint or much stronger. The whole evening activity on the instruments but too cloudy to see the auroras. Just before midnight when the sky cleared up the northern lights were visible above mountain Matmora and also Jupiter was shining bright. After a very rainy and dark day we lost the hope of seeing the northern lights although there was activity on the instruments in daytime and in the beginning of the evening. Around 23.25hrs. loc.time there was activity again and an open part in the sky showed the auroras even pink coloured. 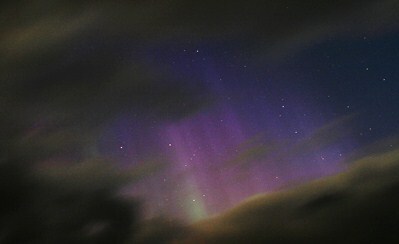 After I took this picture of aurora and the big dipper a strong hail shower disturbed the show. 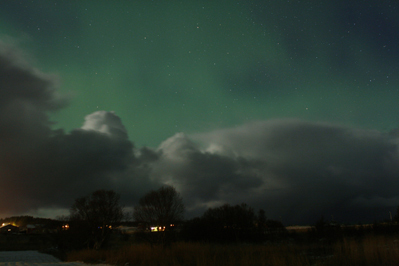 Beautiful auroras between snow showers this evening. 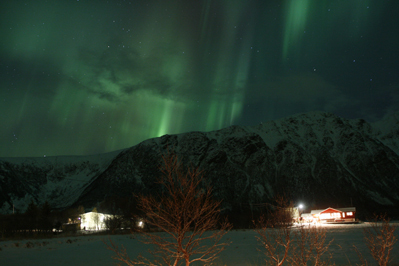 Until now we had 15 nights with visible northern lights in December. 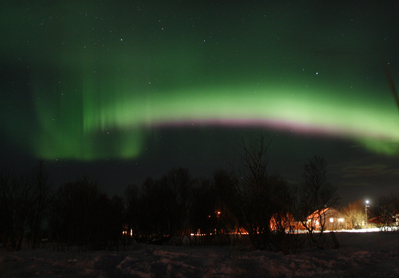 This evening the auroras came suddenly after 20.45 UTC. An effect from a big solar flare X1.8 on Saturday Dec. 20. 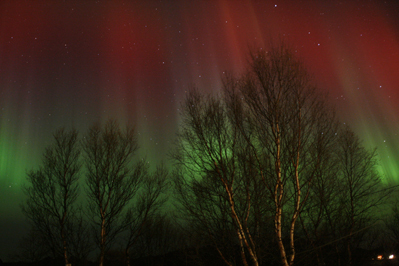 With the naked eye the red auroras were visible although the colours were not so intensive and bright. On the longest night of the year the auroras were all over. Faint, soft coloured northern lights. 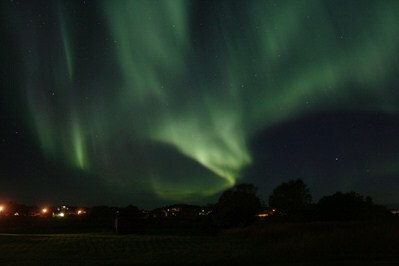 Even when I wake up at 4.00 am the northern lights were still all around us. During the presentation some activity on the instruments were shown. When we went to the beach the northern lights were more active than expected and we could see the nice different forms of the auroras. We were so happy to share this with a family from Singapore. Tonight foreign TV program makers are interested in what we are doing, here in and around the Polarlightcenter. They are filming for many hours and fortunately Lady Aurora is joining us for a while. We always think we need a clear sky to view the auroras. At the moment I went out to take a picture it started to rain. It is a funny to feel the raindrops all over and to see the northern lights at the same time. 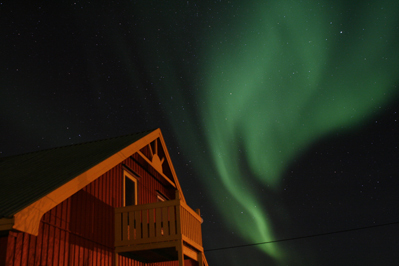 Our Brazilian guests were so lucky to see the northern lights while they were staying here just for one night, by circumstances. Most of the time we advise our guests to stay minimal three nights to maximize their chance. 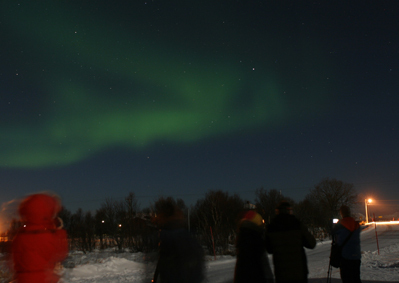 For about 45 minutes lady Aurora appeared and showed herself to the lucky ones. Short after midnight the whole sky filled up with northern lights. 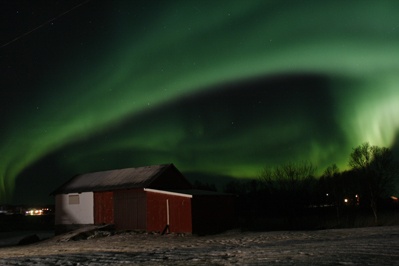 As a result of low density but high speed solarwind the auroras were faint but spectacular. 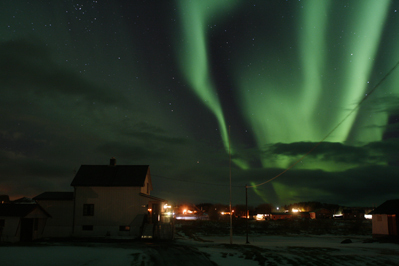 It lasted for more than one hour and afterwards the auroras became pulsating without colour. 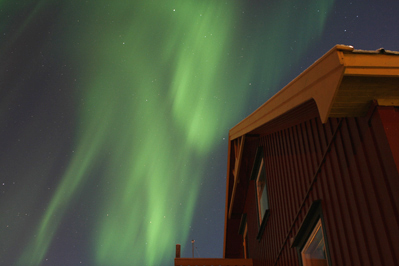 This evening strong northern lights in the west, east and above our building. 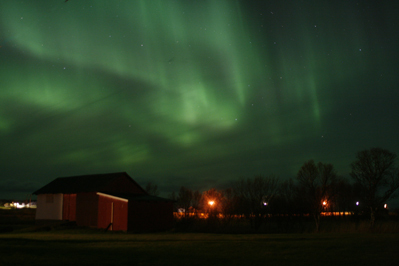 In the east several bows and from the back yard it is nice to see our centre surrounded by green auroras. 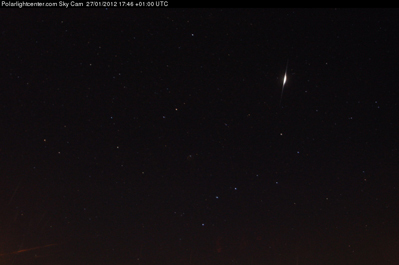 Around 23.00hrs there was strong activity for a while but unfortunately many clouds appeared too. 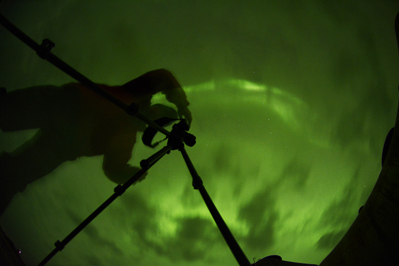 Our instruments are very helpful but sometimes it is also frustrating to know the activity is strong enough but we cannot see the northern lights because of the clouds. This evening the bright moon was also waiting for the auroras to come. At the beginning they were strong enough to be good visible. 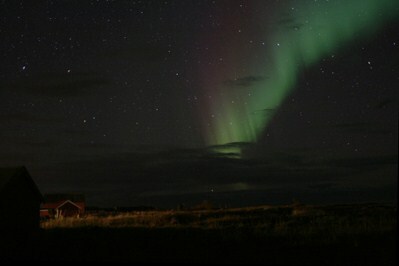 In the north we saw a kind of bow with very strong moving northern lights with lots of colours. 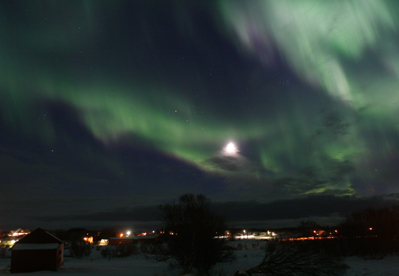 Later the auroras became more faint and were less visible due to the moon light. 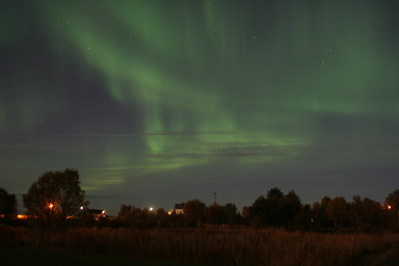 October was really great with so many evenings and nights northern lights. The first weeks we had many clear days, the last week was more cloudy but still with more or less auroras between the clouds. What has November in the offering? 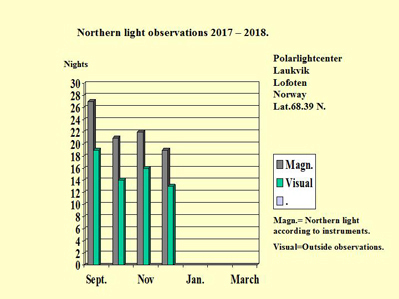 This month we have seen until now 17 nights northern lights here in Laukvik. 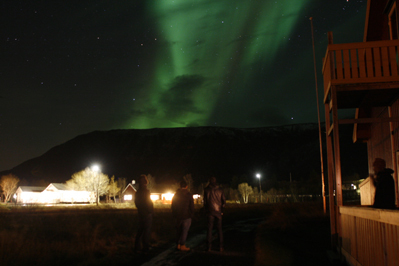 This evening we stopped the presentation several times to view the auroras. Just in front of our door but we also went to the beach where we enjoyed the lights all over under a sky full of stars. 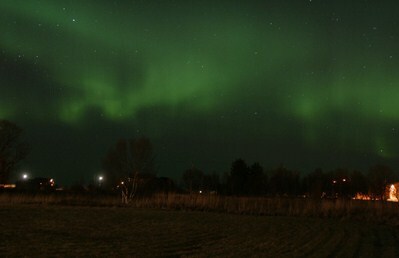 At about 18.45 hrs loc.time the northern lights became already visible although it was not even dark. Soon they went overhead and became very active in the south. 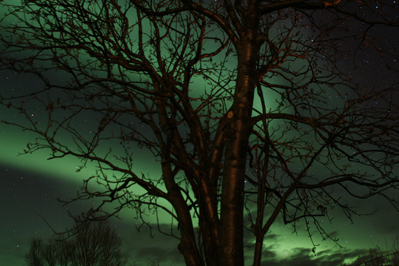 The trees in our back garden became even more beautiful surrounded by the colours of the northern lights. This evening the auroras were amazing! 23.00hrs. 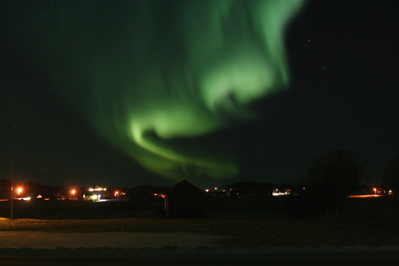 the auroras were overhead like a swirling river with rolling waves in many different colours. 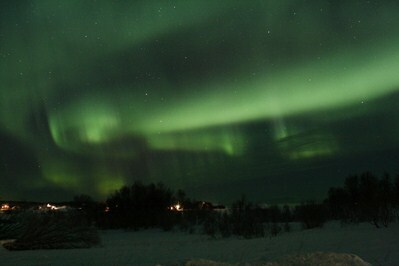 This evening around 23.45 loc.time the auroras were dancing in the sky. Because of the very good visible earth magnetic field lines in the structure of the northern lights it looked like rain showers. 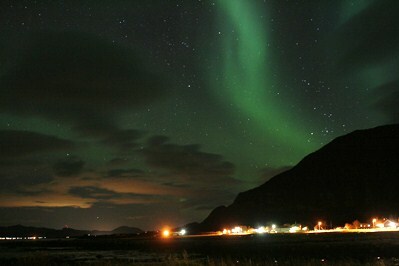 Although the Sun is very quiet at the moment we saw beautiful northern lights before and around midnight. The instruments showed strong activity as a surprise. 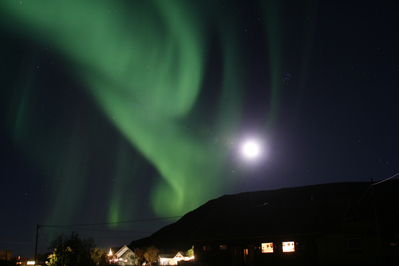 It is a magic moment to be outside under a bright moon to see the auroras dancing and under such ( relat.) warm circumstances. For some nights we had cloudy evenings and nights although there was northern light activity.Tonight it cleared up and strong auroras were to be seen in the east, west and in the south. 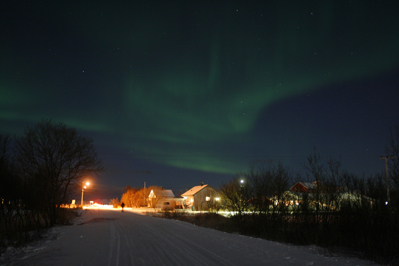 Northern light activity was K5 ( = Kp 4 ) for some hours before and after midnight. It is always a warm welcome if lady Aurora appears short after our new guests arrive to stay with us for a week or so. On an evening with a lot of clouds it is hard to believe that she will come. 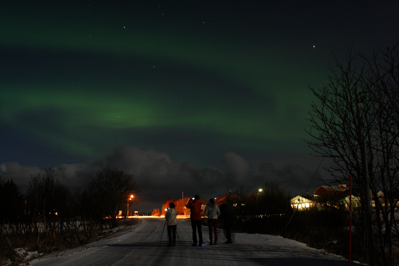 Here, close to the sea, parts of the sky can be clear for a while and we enjoyed the beauty of the northern lights. Three nights in a row beautiful auroras for many hours. This is what we call equinox auroras. 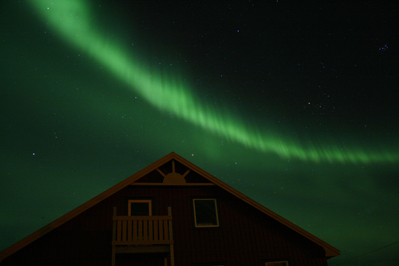 All our guests who get the SMS-alerts are so happy to see the northern lights in different and moving structures. At around 22.00 hrs. loc. time I went to the sea shore. The orange coloured moon just popped up and reflected in the sea water as well as the auroras did. 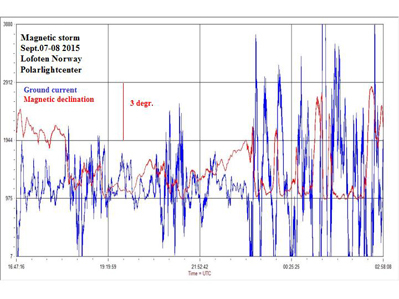 In 24 hours time 2 CME's arrived and caused strong magnetic variations on our instruments. The first night far after midnight at 02.00 loc. time. 12 Sept. at 22.40 loc. time the first faint streamers of auroras were visible and here in Laukvik more and more clouds came in and the northern lights were not visible anymore. 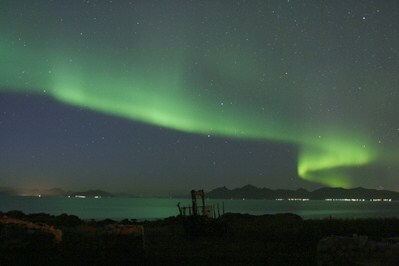 Fortunately in another part of the Lofoten guests could enjoy the beautiful auroras. The new season has started !!! Some hours, after a small CME effect, the auroras were visible in the north east and later this evening much stronger in the west. Also during the early night hours. This evening we went to the beach to look at the beautiful Midnight Sun and to the large sunspots. With his telescope Rob was projecting the sunspots on a white piece of paper. At first faint northern lights were visible in the north and in the west. 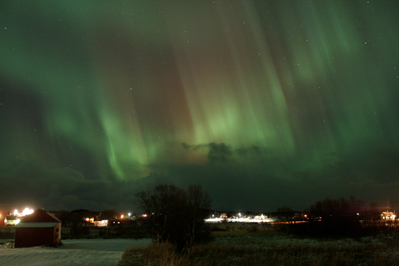 Later pulsating strips of light were to be seen in the east and high up in the sky. Like the weather forecast predicted the sky cleared open. 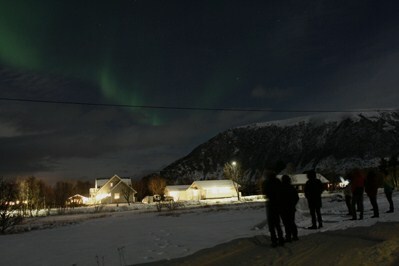 But first we had to wait for some activity and around 22.30 loc.time we and our guests could see the auroras. First quite faint but some later with vertical rays and even much brighter. 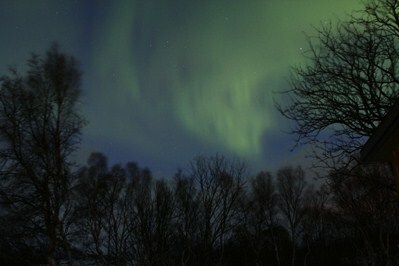 This evening the magnetic variations were very low but the auroras were nice to see in the dark. After many cloudy days and nights we enjoyed a clear sky and bright moonlight. For many of our guests it was their last chance (evening) to see the northern lights which made these moments very precious. This evening there were very strong magnetic disturbances on our instruments. The Kp index was official 6 and the local K index was 7. Unfortunately it was total cloudy at the beginning but later we could see beautiful and strange enough faint red and green coloured auroras. See: www.poollicht.info and in Great Brittania and Scotland. 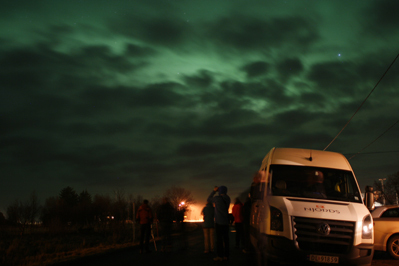 Just before our guests wanted to leave, the instruments showed more activity and for about half an hour the northern lights were visible behind and between the clouds. 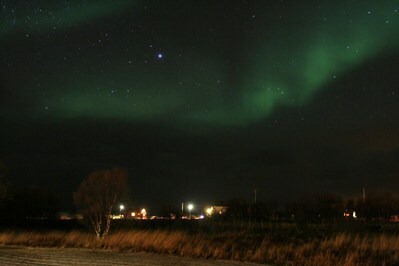 Nice enough to see them for the first time or to take for the very first time pictures of the auroras. It is exciting to know there is activity on our instruments and looking to the weather satellite information we just had to wait for a clear sky. 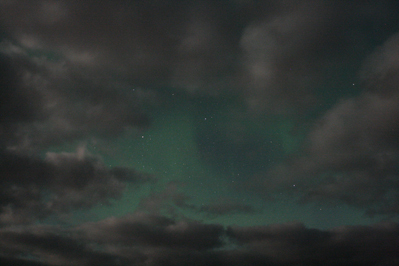 Short after the presentation there were some auroras visible behind the clouds. After midnight the northern lights were visible in open parts between the clouds and many of our visitors could enjoy it. The Sun was complicated this week and several CME's were underway. 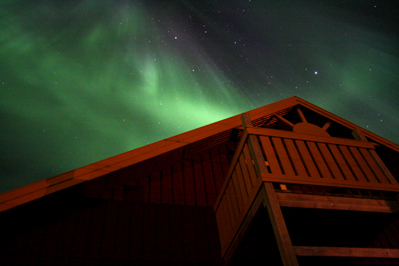 Our overnight stay guests saw three nights in a row amazing northern lights in many different structures. 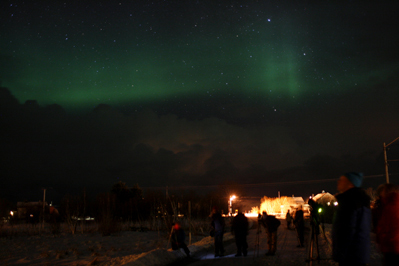 When the guests arrived for the northern light presentation a nice aurora bow was already to be seen. Short after the auroras became stronger and we decided to go to the beach to view them. During the presentation it became cloudy but the activity was strong enough. 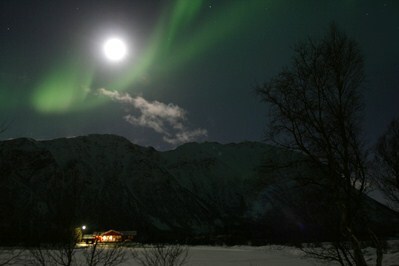 Later that night, I saw the northern lights at 3.30 loc.time together with the bright moon. It was such a beautiful night! This evening the clouds opened up and faint northern lights appeared. 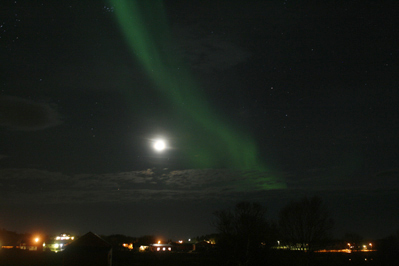 Althought the moon shine is very bright beautiful soft greenish auroras were visible from west to east. Its always hard to know there is high activity when it is cloudy. The weather satellite (SAT 24) showed some open parts to come within some time. We were just waiting and yes the auroras were shining through the clouds. 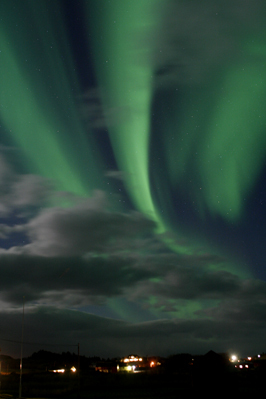 Auroras and clouds together is just such a dramatic performance. we saw later this evening fantastic auroras. 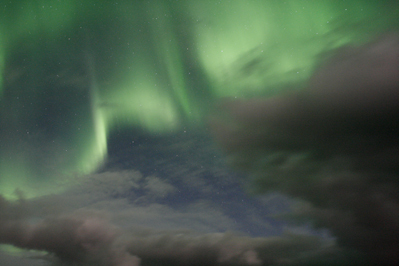 High up in the sky the northern light crown appeared several times, moving and colourful. Even looking to the south the auroras were visible. This evening the northern lights were amazing. Starting low at the northern horizon and later they were to be seen all over. Bows and stripes, explosive clouds of light, moving and curling, even pink coloured. 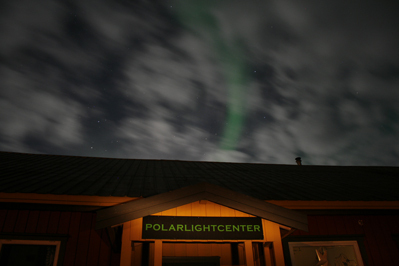 What a pleasure it gives if new guests arrive and after some hours already the auroras appear in front of the polarlightcenter. After a long day of traveling up north, it is a gift to see the northern lights in all her beauty. After many quiet nights there was more activity again. Just after the presentation we went to the beach to enjoy the northern lights and saw her dancing movements. We were not for sure if the auroras should appear this evening. But they did and had nice forms, also the pink colour was to be seen. 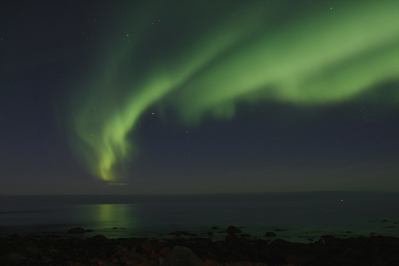 Even the sea water transformed into green and reflected the colour of the northern lights. During the presentation the monitor showed some activity and we could see some beautiful northern lights for about 10 minutes. Unfortunately the magnetic activity was much lower than we had expected. Hopefully tomorrow another chance. AR 1944 caused beautiful auroras this evening. We did not know where to look. 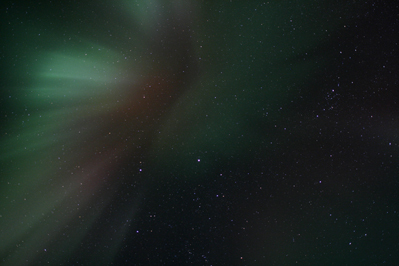 The auroras were moving overhead, colorful and bright. 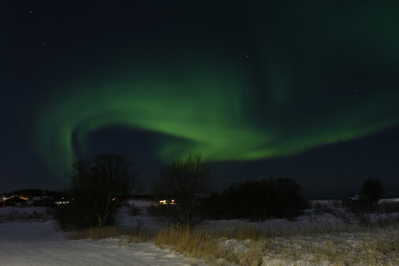 On the first day of the new year the auroras appeared again very early. 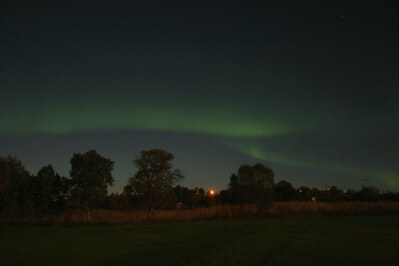 This evening the northern lights were visible one hour before the fireworks started around midnight. 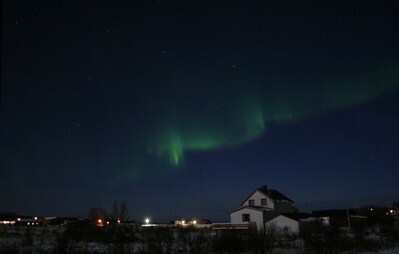 Very early today the auroras appeared. About 16.30 hrs loc.time they were to be seen at the strongest for about 15 minutes. 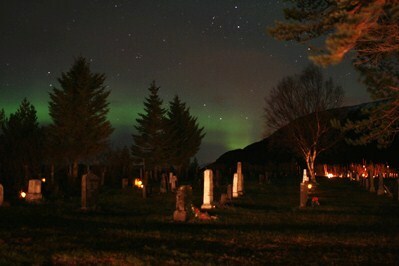 At the graveyard of Laukvik the beloved ones were surrounded by little lights and under a weak northern light bow. This evening the northern lights started very early low at the northern horizon. The static bow changed into several stripes and with low magnetic activity and bright moon light the auroras were faint but extremely beautiful. The whole evening there was high activity and we had to wait for a clear sky. Looking to the weather satellite information we knew a clear part was coming. 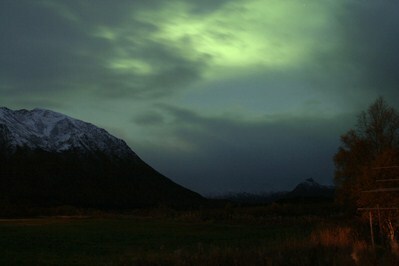 Around mignight a bow round the moon appeared and some later the auroras were visible above mountain Matmora. This evening the northern lights started early. Strong and moving and also high up in the sky. Later the auroras became more faint because the density of the solar wind was low and the magnetic component more north. Beautiful auroras typical from a coronal hole. It is such a pleasure to have clear days and nights again! 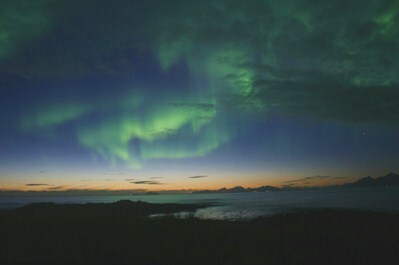 Although the Sun is behind the horizon we enjoy the arctic light in daytime and in the nights the auroras. Also coming night there will be northern lights due to a big coronal hole. 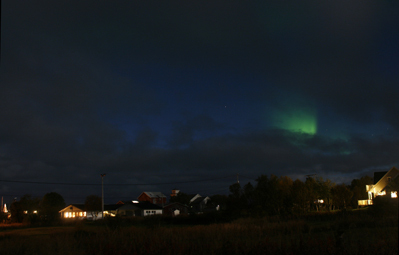 Early in the evening the auroras were visible between the clouds. This evening the northern lights appeared very early, low at the northern horizon. 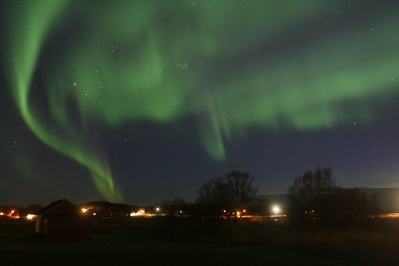 Some hours later again and just around midnight the auroras were most active, due to a coronal hole. From west to east, the whole sky was enlightened. Amazing and it is just in front of our door! Just after dinner a nice northern light bow appeared. 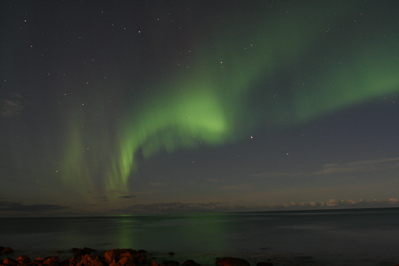 When we reached the beach the auroras became stronger and even the sea water glowed greenish in the dark. 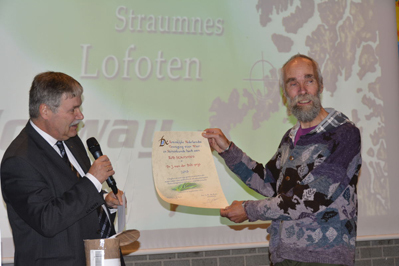 He was honored with this prize for the efforts Rob made as a researcher of the Aurora Borealis and for popularizing this phenomenon for a wide public. 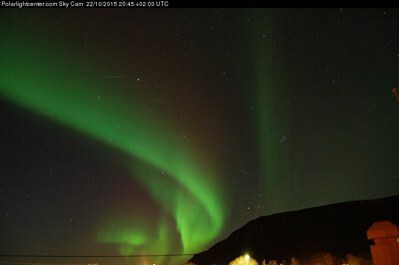 Yesterday evening and tonight finally the effect of a CME approached Earth and caused beautiful auroras. 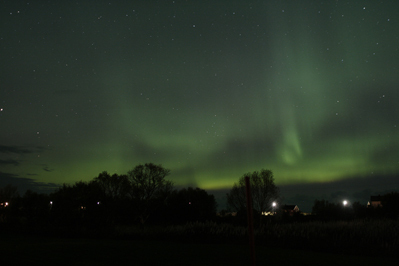 Last night the northern lights appeared between rain showers but tonight the sky was much more clear. In front of the Polarlightcenter we could enjoy the northern lights in the west. The planet Jupiter is so bright even in the moonlight. 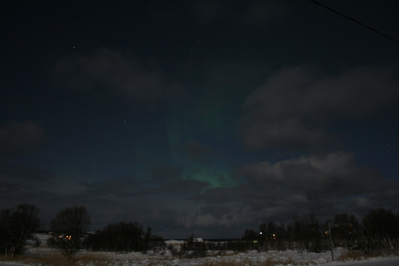 The auroras appeared between the clouds, faint but beautiful. We are waiting for more nights with northern lights. This evening the first snow of this season fell down and changed our world in a fairy tale. The northern lights appeared before the evening presentation started and also in between. 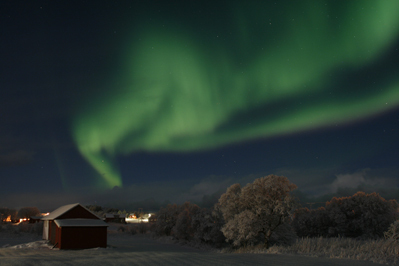 It is so wonderful to feel the fresh air and see the beauty of the auroras in this white landscape. Sometimes it is hard to make the decision to wake up your guests in the middle of the night. 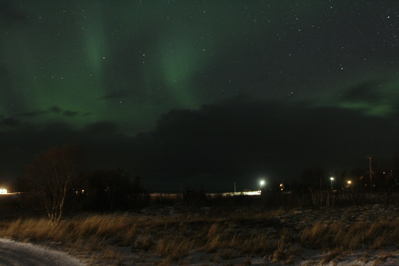 At 02.45 loc.time the sky cleared up and the northern lights were visible. We had to look to the south because of the strong magnetic activity. 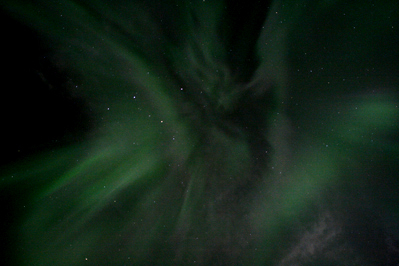 Just before the magnetic storm arrived beautiful auroras were visible around us. High up from east to west and in the north. For about two hours we were outside to enjoy it. It is great to have clear nights again. The moon is stil bright and the auroras were amazing for some moments. 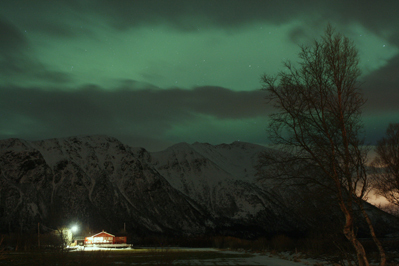 This evening at 21.05 local time, we got an aurora surprise for about 10 minutes. Around midnight the northern lights appeared again and we could see them dancing and moving from east to west and high up in the sky. We have got a very nice autumn. It is a pleasure to stay outside in the evening with the bright moon, the northern lights coming and going very quickly, a temperature of about 16*C and the clouds ufo-shaped. 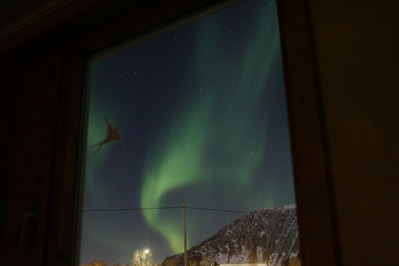 It was like the auroras were playing with us. At such evenings you don't want to sleep. The moon was bright and the aurora very faint. The huge coronal hole did not cause the expected auroras because the magnetic component (IMF) in the solar wind was not opportunely in relation to our earth magnetic field. Tonight we were surprised to see the northern lights when the sky was still so bright! We were so happy to see the lights again after a long summer season. 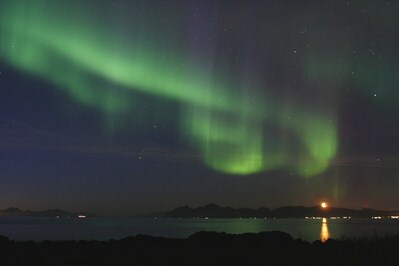 This is a good start for more beautiful auroras to come during the 7 months northern light season. 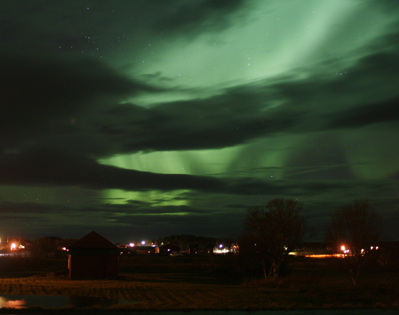 This evening the auroras appeared as a watercolor painting. Snow showers and clouds are all over but the instruments showed high activity. 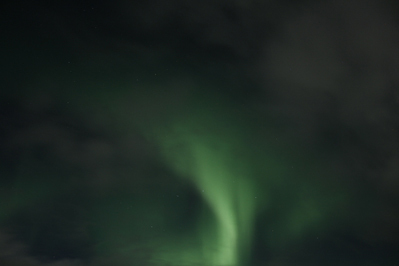 For some moments the sky opened up and the northern lights were visible. This evening beautiful auroras were visible. Just after sunset the comet 2011 L4 Pan-Starrs was visible at the north west sky. The comet appeared on many of my pictures !!!! 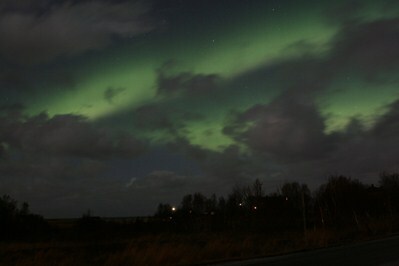 This evening around 22.00h local time nice auroras appeared at the northern horizon. By my surprise, nobody else was on one of my favorits spots here in Laukvik. 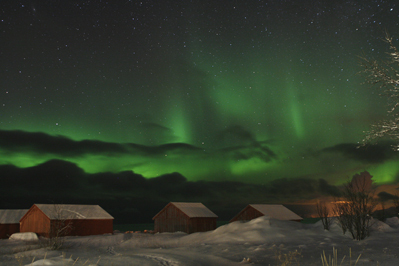 The little boat houses, covered with snow and surrounded by the auroras, are always a nice place to take pictures. 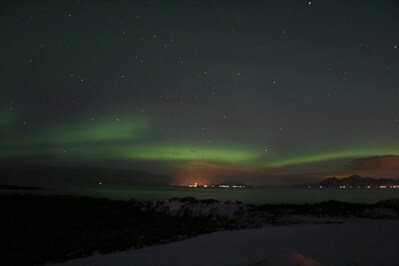 Tonight just after the presentation a part of the northern sky cleared up and some northern lights were visible. This evening during a Polar low with such cold winds from the north we all stood outside to see a glimpse of the auroras. 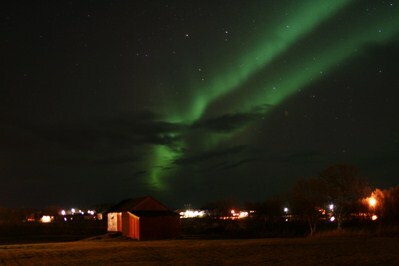 This evening we and our guests enjoyed amazing auroras. We did not know where to look. 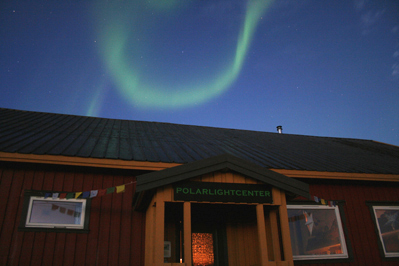 In all directions around the Polarlightcenter the northern lights were visible and even the northern light crown was to be seen twice. We don't need tours or bus trips for "hunting the lights". 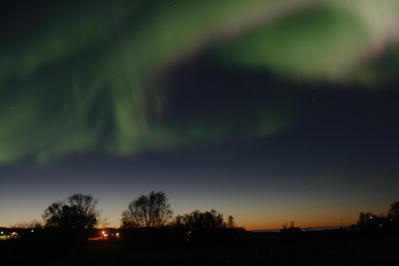 Later at around 24.00h the auroras became stronger and brighter and even the pulsating auroras showed up shimmering in the late night sky and apeared as spooky white lights. Fantastic!!! Until now we had 13 nights with nice auroras in February. This evening around 22.00 local time we saw this nice display but soon after, it became cloudy and the magnetic activity low. This evening our group of visitors for the northern light presentation viewed a beautiful northern light bow before they even entered the Polarlightcenter. We had to stop the presentation again two times because the monitor showed activity. Everybody ran outside to welcome and enjoy the beautiful lights. 21.05 until 21. 55 hrs. local time. In the beginning of this evening the auroras were shining through the clouds in the north and gave the impression as green waves in the Norwegian sea. Just after the late afternoon lecture some northern light was visible at the northern horizon. 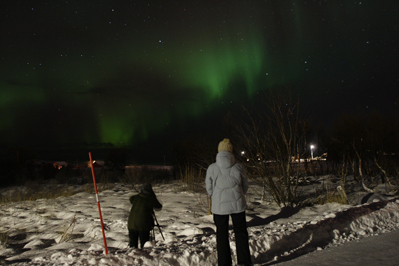 Some hours later the auroras became stronger and our guests were enjoying the lights and were taking some fine pictures. This evening the sky cleared up and a faint northern light was visible. We sent an sms-alert to 23 people and low at the northern horizon the faint bow became more clear for more than one hour. 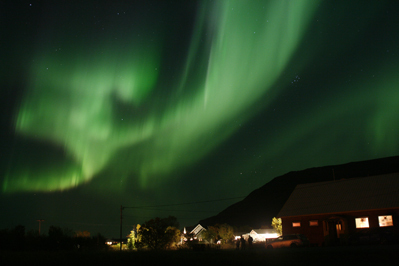 To see the auroras for the first time in your life, it is a great experience. 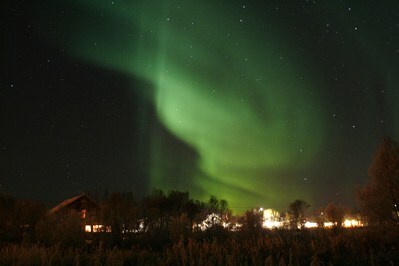 The northern light was still glowing from west to the east in the twinkling starry night for many many hours. For more than two weeks the Suns activity is very low. Where are the big Sun spots as during the last Solar maximum in 2001 and in 2002 ? Without the expected activity here under the polar oval we have had nights with low activity northern light and where you could see soft greenish stripes and bows like last evening. The coming days we are expecting stronger auroras due to coronal holes. 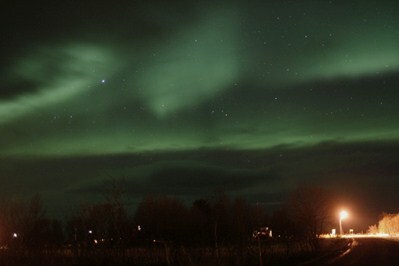 Yesterday evening there was strong northern light activity but it was very cloudy too. Later that evening and last night the clouds break and in all directions the beautiful lights were shining through. 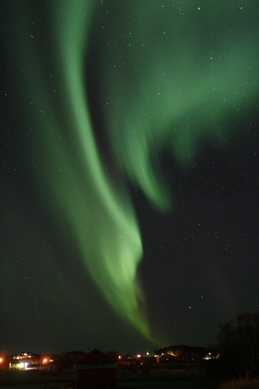 For some moments even the northern light crown was to be seen straight above us. Last night at 00.20 loc.time, I was already in pyjamas and after a last look out of the window great auroras were to be seen in the north, north-west. 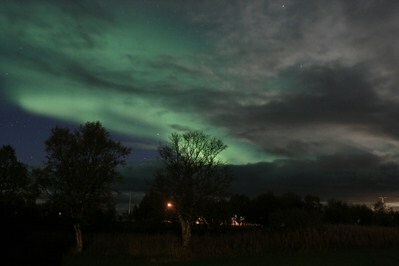 The cloudy sky had cleared up again and the northern lights lasted for about 20 minutes. 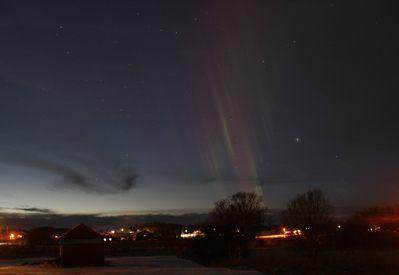 This evening a nice northern light bow was visible about 30* above the horizon. 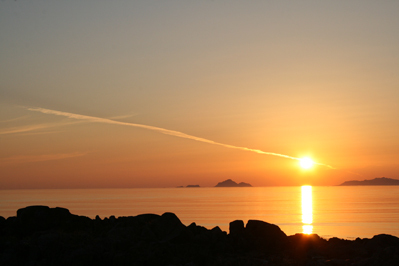 When the Suns activity is low and the sky is clear often a bow is to be seen above the sea, low at the northern horizon. Last evening around midnight the clouds disapeared in the north. There was some activity on the instruments and we could see some nice auroras but faint due to the moonlight. only some bows and greenish clouds were visible. December 2012 is a very active month. 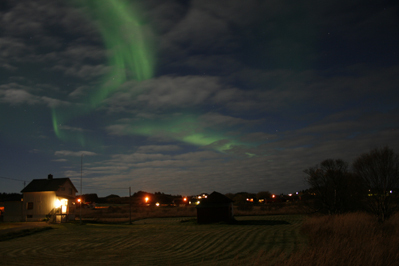 Due to clear skies we already enjoyed 11 nights with auroras although the activity of the Sun is still very low. 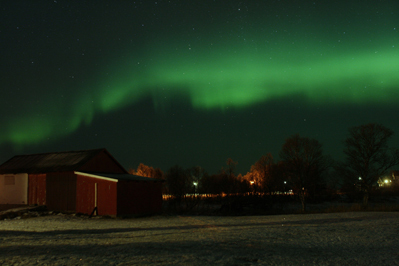 Also this evening beautiful northern lights showed up again, together with many bright burning Geminid meteors. 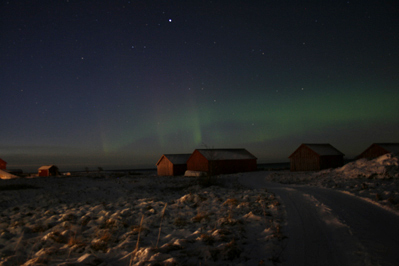 For many nights in Dec. we have low aurora activity with a nice northern light bow visible above the northern horizon. Last evening however there was more activity by surprise and after most clouds cleared up strongly moving northern lights were to be seen high in the sky. This evening beautiful moving and sometimes colourful northern lights showed up, probably as an effect of a coronal hole. I was on my way to the beach but had to stop at the house of my neigbour Vibeke to take this picture. This evening we are waiting for the expected CME shockwave. 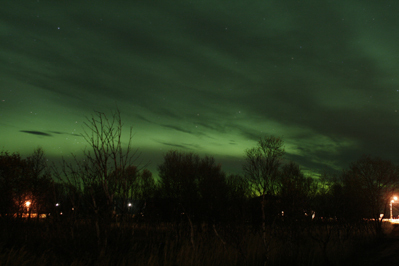 For some moments, at about 21.15 UTC, nice northern lights appeared. Nice enough to watch and to photograph. A group of Italian photographers are also able to take some nice pictures after we sent them the sms-alerts and our Swiss guests are also very happy!! But.... we are still waiting. The fourth night in a row we were so lucky to see the northern lights. 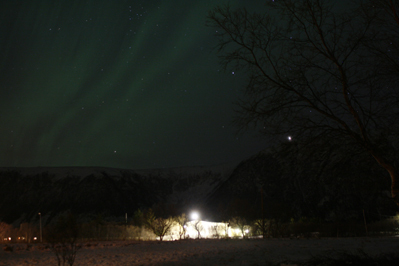 On this picture is is to be seen the school of Laukvik and mountain Matmora under the auroras. This evening around 21.30 lwt. 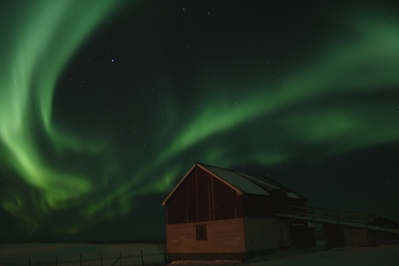 an explosion of auroras were to be seen. 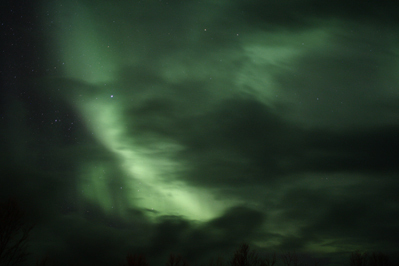 The auroras were surrounded by clouds and it was amazing to see and feel the power of its beauty. Last evening for a short moment the instruments became active around 21.30 hrs UTC and we could see moving and soft coloured northern light together with Jupiter ('s halo) and the Pleiades cluster. For our guests and us it was an unexpected surprise. 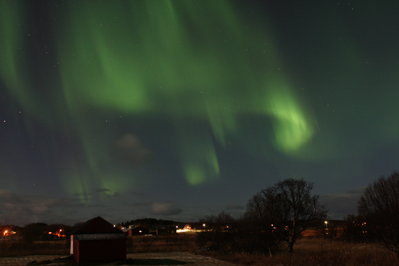 Although the Sun is quiet, we had three nights weak and strong northern lights due to a group of small coronal holes. Clouds, snow showers, clear sky and thousands twinkling stars appeared in short moments. The last two weeks of October the Suns activity was very low and the northern lights refused to appear. 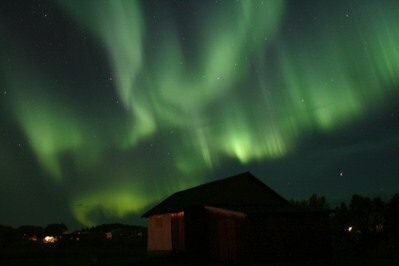 Disapointing for our guests who wished to see the auroras. 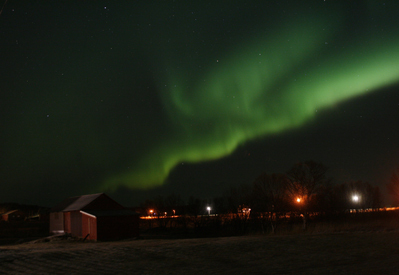 This afternoon a CME arrived and tonight the whole sky was illuminated by the magic northern lights. We all were so happy! 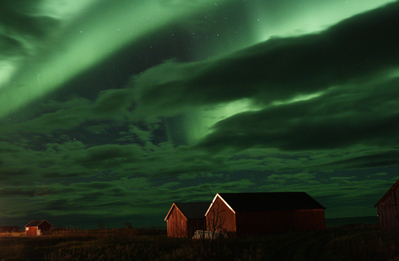 Until now October has 13 nights with beautiful auroras. 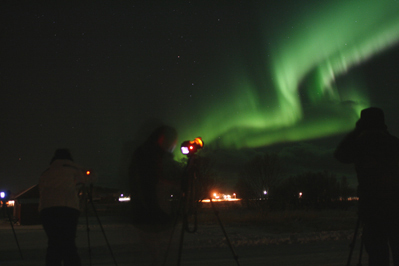 There were also some nights with pulsating auroras. 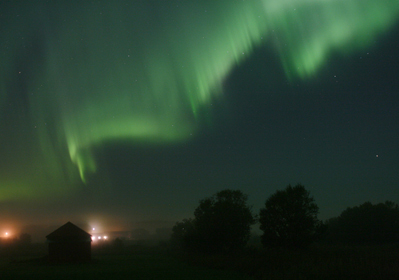 October seems to be a good month for northern lights. Already 5 nights with sometimes weak or strong auroras. Last evening however there was firework in the sky. It lasted the whole night until the early morning hours. 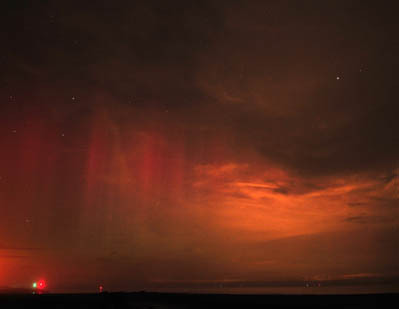 The dynamic and sometimes pink colored auroras were to be seen all over, even at southern directions. Although it was magnetic quiet the auroras appeared at the beginning of the evening and were to be seen low at the northern horizon above sea. 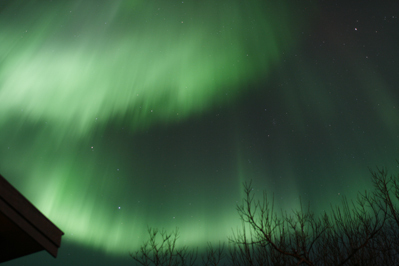 The colours were soft and the auroras were moving and transparant. 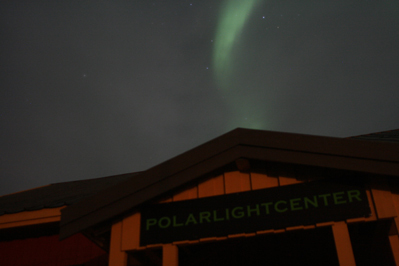 The camera on the roof of the Polarlightcenter is working again ! Last night the northern lights were moving above our heads and the camera could make the first picture of this new season. Yesterday evening the sky cleared up and nice twinkling stars were visible after some cloudy nights. 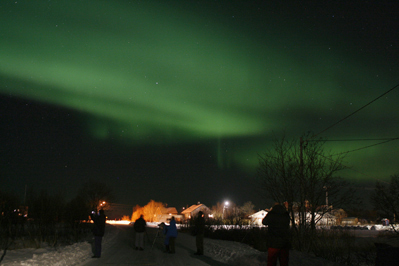 Due to a very small coronal hole, we and many other visitors here in Laukvik could enjoy the beauty of the northern lights. 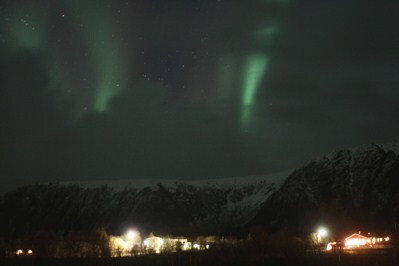 The first visible auroras of the new season ! Around midnight the first stars were visible again after a long period of lightness. And.... the expected auroral activity from a coronal hole. 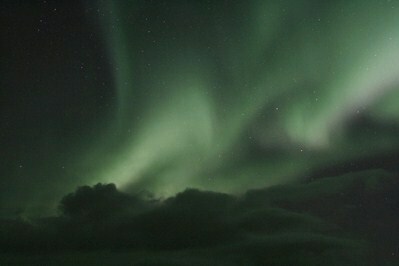 The instruments showed us the magnetic disturbance and we left our warm bed to enjoy the first auroras. 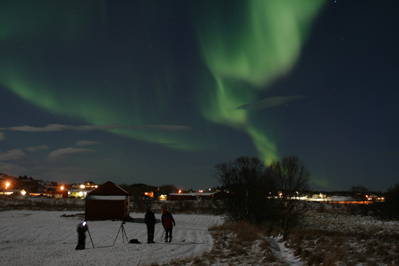 We hope this will be the start of a wonderfull active auroral season. 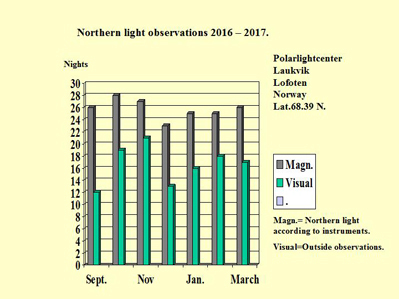 The statistics of the last northern light season show us that the Sun was not yet so active as expected. The beginning of April shows the planet Venus and the Pleiades in conjunction. 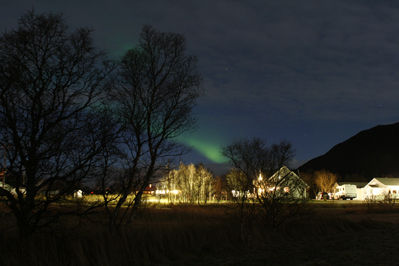 For our guests it was great to see the northern lights on their last evening they were staying with us. 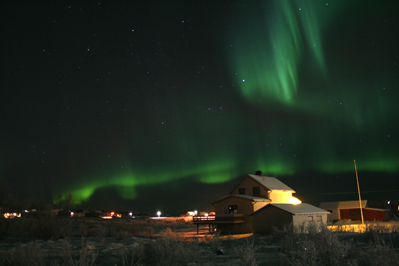 Close by our centre is a lovely spot to view the auroras. The moonlight was just bright enough and with the sound of the waves and the northern lights above the sea it was a great evening. Northern lights above our heads and after midnight in southern direction. March started to be a good month for viewing the northern lights. 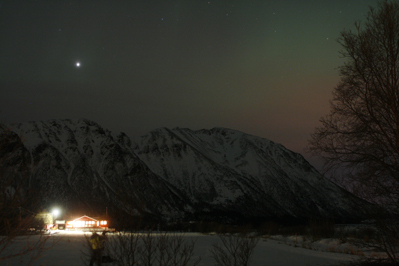 Until now, we and our guests enjoy 16 nights with visible northern lights together with the planets Venus and Jupiter. 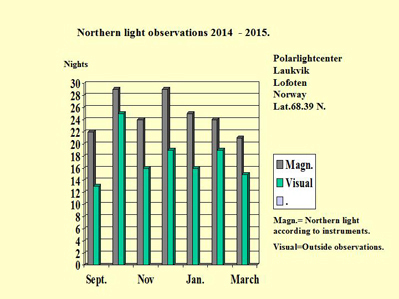 This year March seems to be a very good month for Northern light. 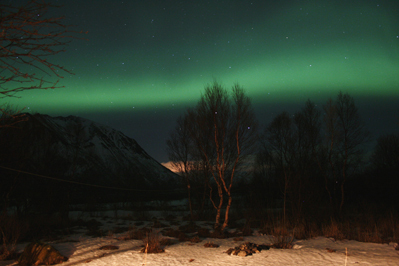 Until last night we enjoy visible northern light every evening. 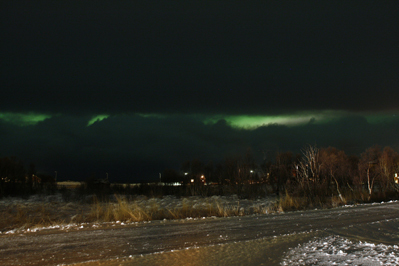 Last night the auroras were visible between and behind the clouds. Sometimes low above the horizon and often above our heads. The Sun is very active at the moment which is promising for the coming nights. Today very early the northern lights appeared as a dear Valentine: from about 17.00hrs, local time, until the next morning 6.00hrs. This flare is a reflection of sunlight on a solar panel of an iridium communication satellite. 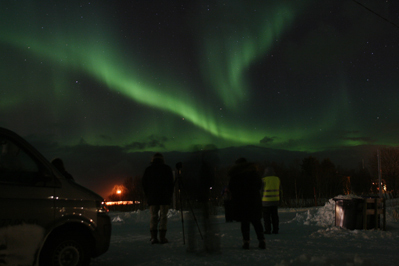 Just after the first signals on the instruments like a magnetic shock wave we and our guests were outside for many hours to see the moving auroras again, covering the whole sky in the west, east and south. 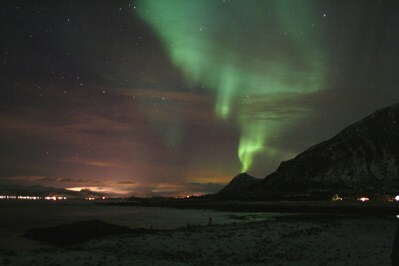 The northern lights were moving and dancing and we saw many times the northern light crown, see picture. 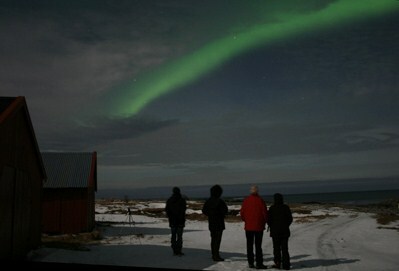 Yesterday evening we and some guests could enjoy beautiful northern lights. Although the moon shine was so bright the auroras were very good visible and the lights were dynamic and sometimes colourful. 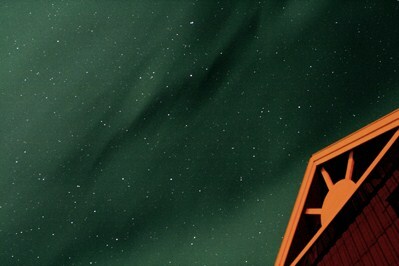 Last night Rob took the first northern light picture with the night sky camera. After a long time of experiments with the help of our friend Sandor Zeestraten and Nikon Service Point Nederland, Rob realised a night sky camera on the roof of our centre. This system is computer- controlled and between two rain showers the camera took this picture. 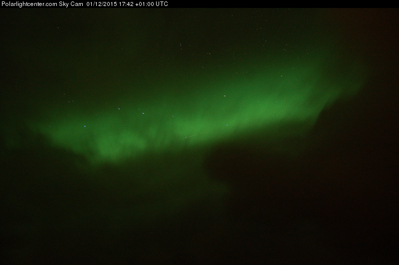 Click on the link:sky camera Polarlightcenter and you get the last (northern light) picture. Last evening we enjoyed beautiful red auroras. People are always wondering if they shall see the same bright colours when they see the northern lights by themselves as most of the pictures show. We always answer that the colours on pictures are much brighter than in reality. 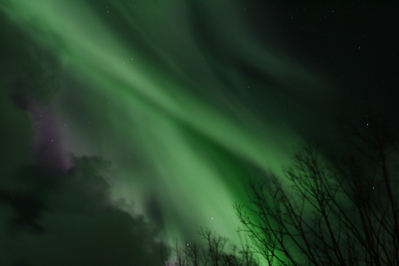 Last night we enjoyed beautiful northern lights and some of my pictures show the same colours as I saw them myself. But.... maybe everybody sees them in a different way. 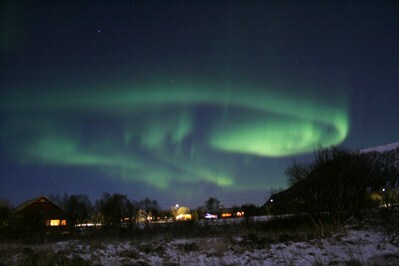 This is a picture of the northern light crown. After the Solar explosions September 24th we were waiting for the lights to come although the explosions were not full Earth directed. It was the beginning of enormous magnetic storm. Some guests who were traveling back south received a SMS-alert. 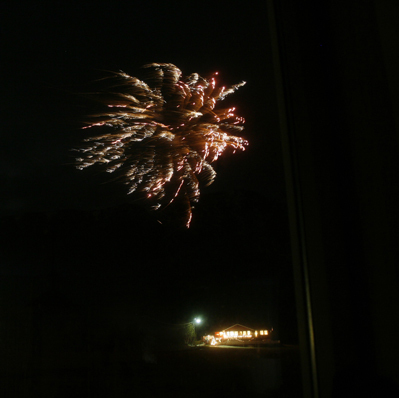 Here in Laukvik, however, the sky was covered with clouds and it was raining at night so we missed the show. 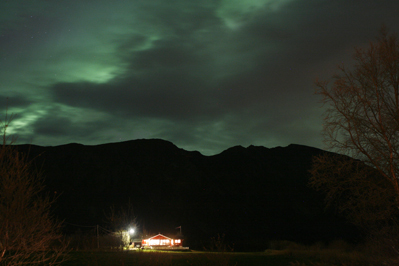 Some guests are so lucky to see the northern lights already some hours after they arrived. Together with friends and guests enjoying the lights makes us so happy and although the northern lights were not so strong we could see the beauty. 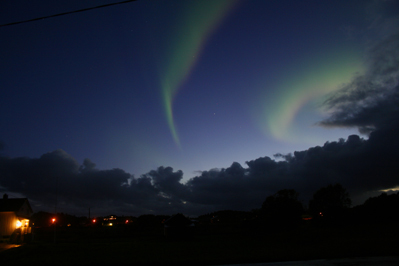 September started with cloudy and foggy nights but there was a lot of Northern light activity. Two guests all the way from Hong Kong were so anxious to see the lights when they saw the strong activity on our instruments. They decided to jump in their car and were driving around in search of a open sky and......they succeeded. See the picture from Yan. 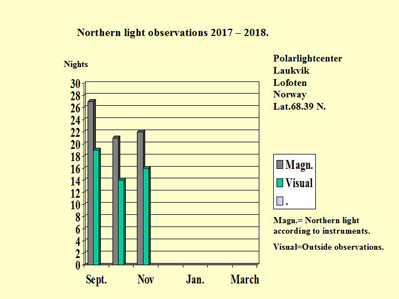 Last season from the beginning of September until the end of March the statistics show us in the gray lines the northern light activity on our instruments. The green lines show us the visual outside observations. January was this year the most active month ! The difference between gray and green means a cloudy sky. 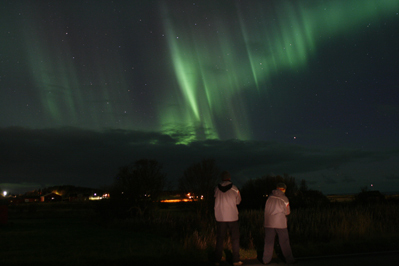 The Sun was still not very active but due to coronal holes, we and our guests enjoyed many nights with beautiful displays. 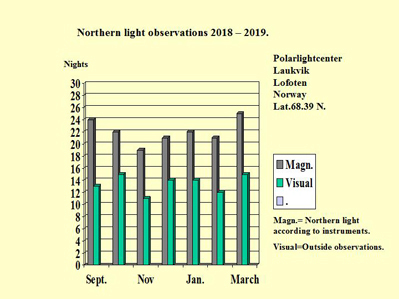 Although we enjoy during the summer the midnight Sun and the amazing bright nights we are looking forward to see the first stars again at the end of August and.......the Northern Lights. all her admirers around the polarlightcenter. 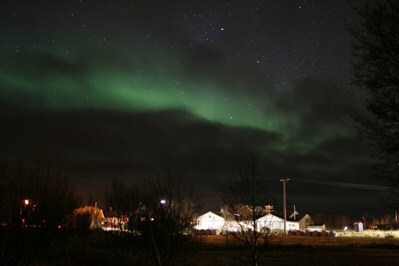 The activity was too low for strong northern light activity. On Febr.15th 01.56 UTC a first X-flare ( X2.3 ) of the new solar cycle nr.24 escaped from the Sun. The plasma cloud is Earth directed with a traveling time between 42 and 50 hours. That means possible strong Northern lights late 16th or 17th Febr. This geomagnetic storm will possibly cause auroras at lower lattitudes. Miscalculation: traveling time will be between 42 and 72 hours. Solarwind speed between 1000 and 650 km/ sec. 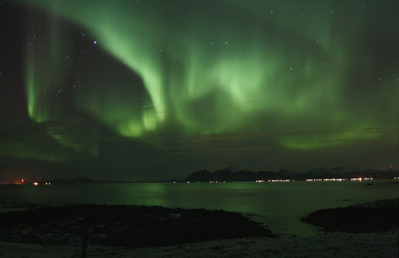 Yes, this week we have been waiting for these auroras. 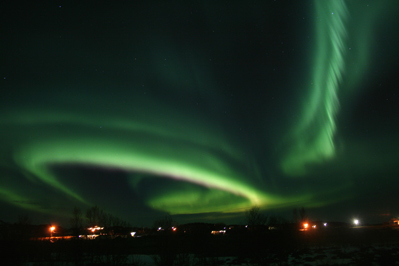 The solar wind, coming from a coronal hole, reached after 4 days the earth magnetic field. The northern lights were amazing ! On the last day of this month we were again surprised by the activity on our instruments. After a very cloudy day, the lights appeared between the clouds and our guests could enjoy it. which changed our island in a fairy-like landscape. surprise the northern lights appeared. 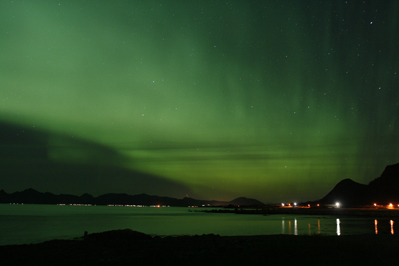 Although the solar activity was low auroras are dancing across the skies of northern Norway. Picture taken by Jan Koeman near the Polarlightcenter at the beach. 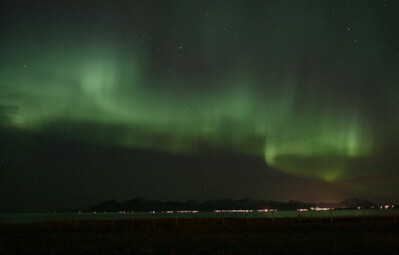 Also the northern light crown was to be seen several times. 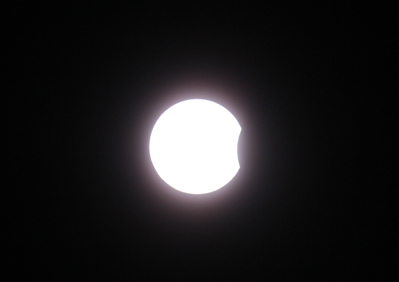 Yesterday there was a total Sun eclipse i.a. on Eastern Island. This beautiful picture is from Joerg Schoppmeyer made in Argentina.